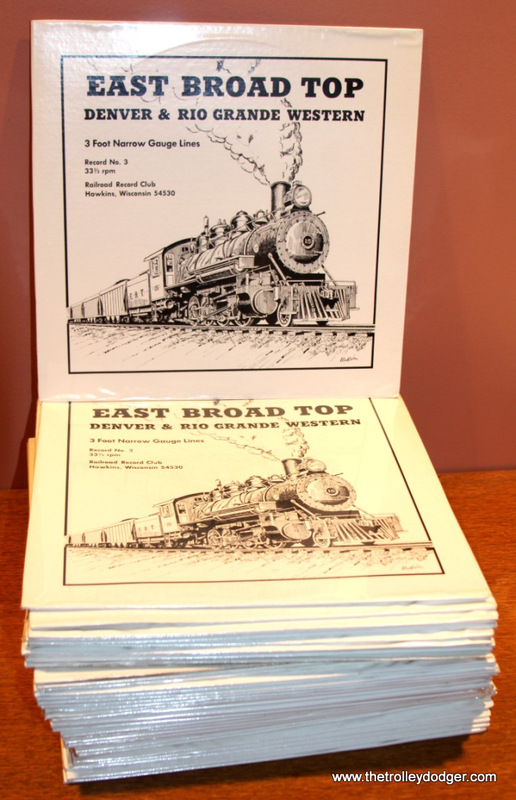 Following up on our recent post William A. Steventon’s Railroad Record Club (September 24, 2018), guest author Kenneth Gear continues with a detailed rundown on his latest discoveries. I have been interested in historic preservation for a long time, and it’s not every day that anyone comes across original material such as this. 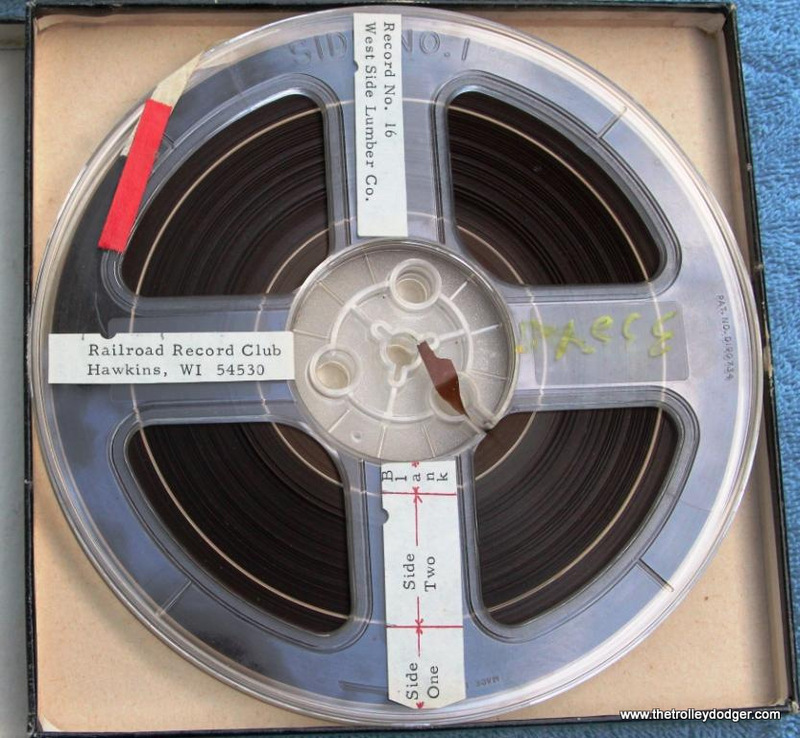 Suddenly, out of nowhere it seems, previously unknown, unissued audio recordings have emerged for some long-vanished steam and electric railroads, along with 16mm motion picture film, and various artifacts related to the Railroad Record Club’s 42 issued LPs, in their various forms. It seems like a miracle that somehow, it all survived to be rescued from oblivion. Getting this done involved a tremendous financial sacrifice on Ken’s part, as he is of modest means. I hope that he will be able to recoup at least some of his substantial investment in the future. 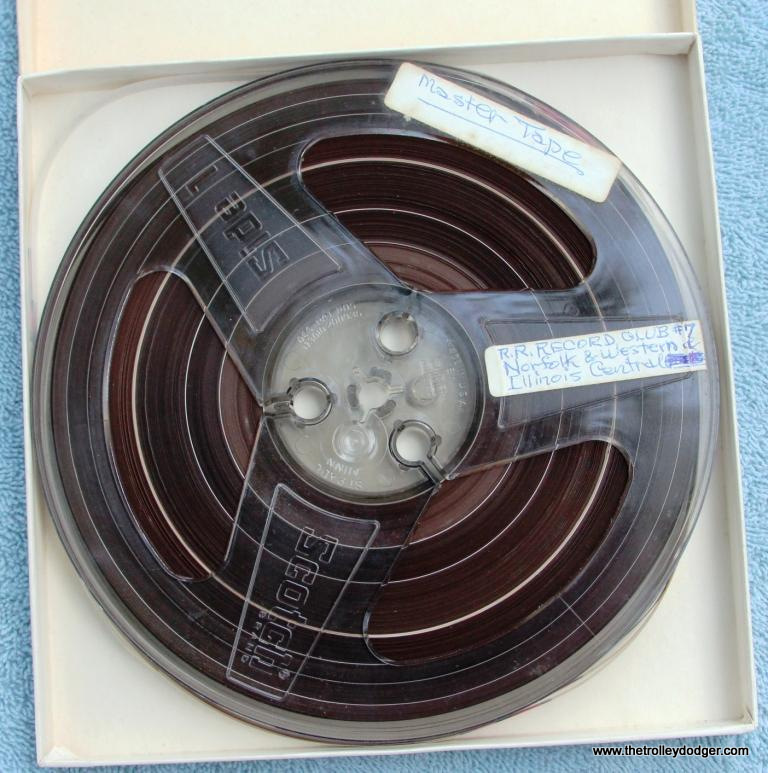 I am sure he will appreciate any contributions you may be able to offer him, towards the cost of transferring some of these reel-to-reel tapes and 16mm movie films to digital. 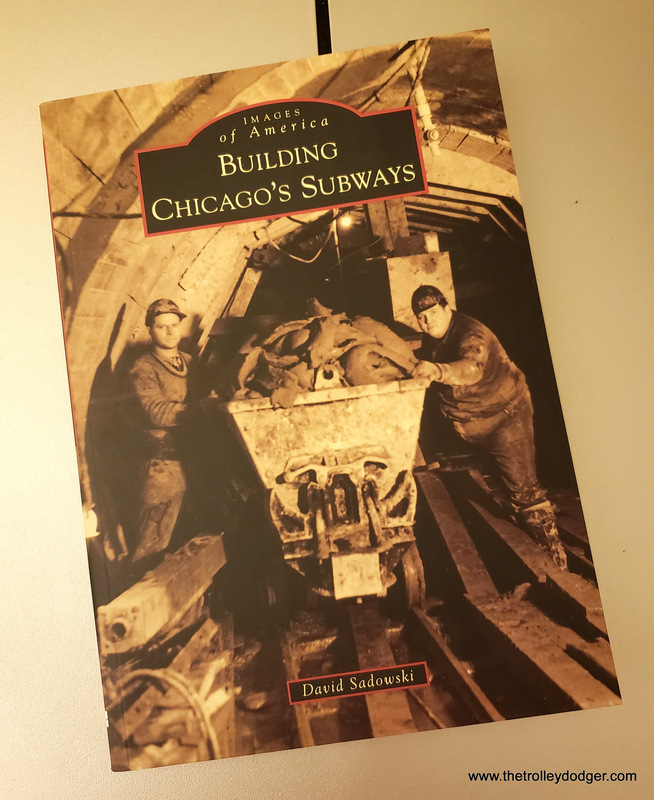 PS- Our new book Building Chicago’s Subways is now available for immediate shipment. If you already pre-ordered it, your copy is already on its way to you. 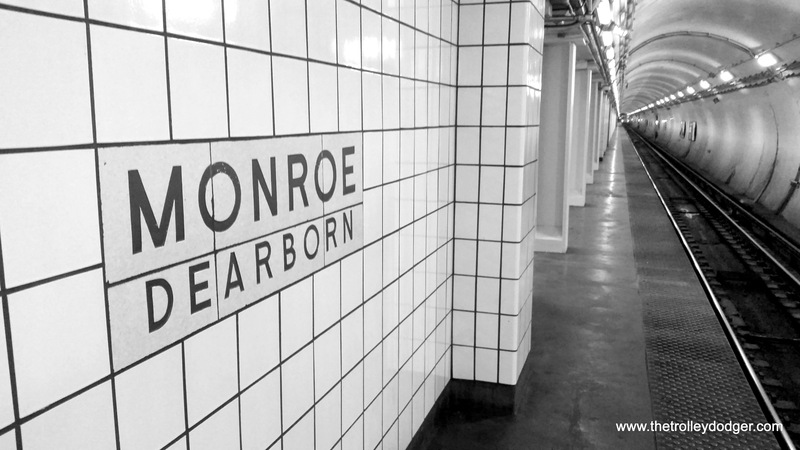 We are excited to have had the opportunity to tell the story of this exciting chapter in Chicago history. Details on how to order are at the end of this post. It’s been over a year since I acquired a large portion of the William Steventon estate. 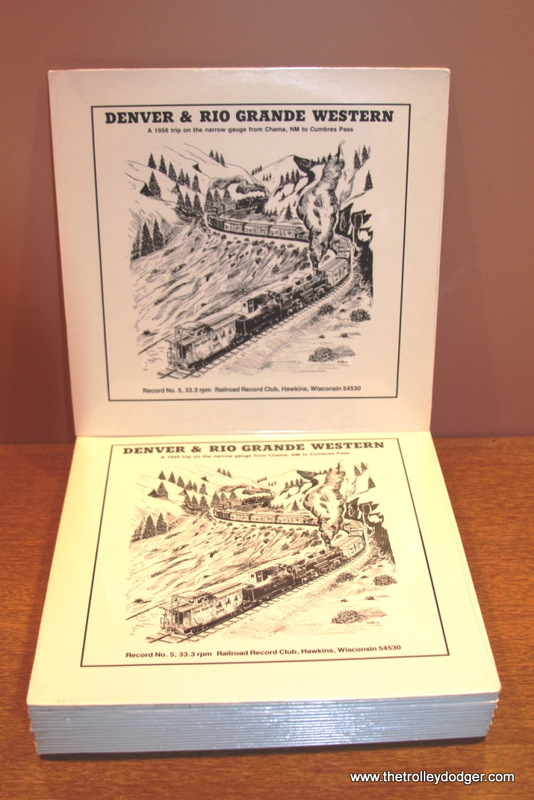 The Railroad Record Club items that I purchased last year have enabled David and I to piece together a fairly complete history of the RRC and to more fully appreciate the time and effort Mr. Steventon put into producing these records. 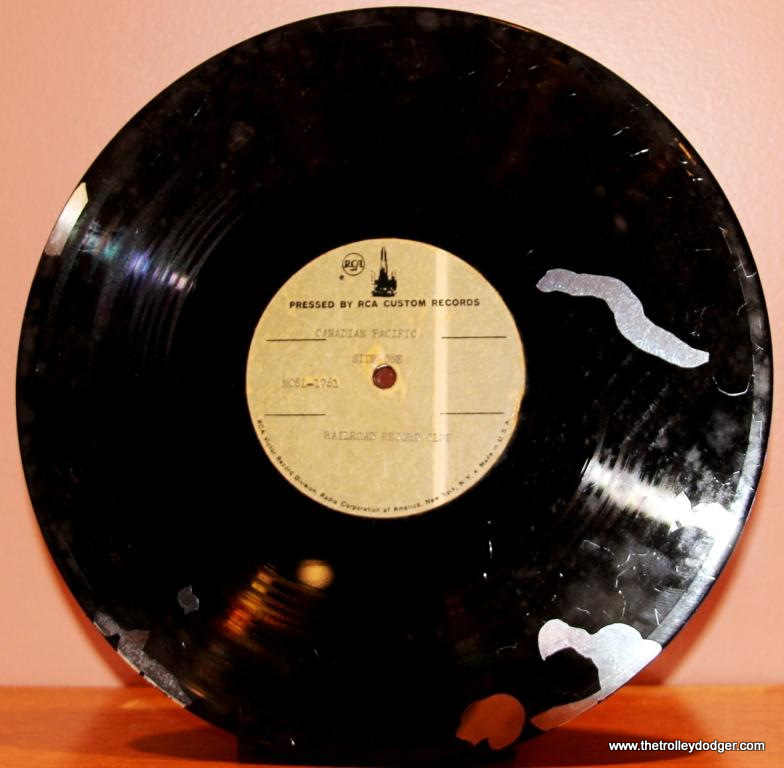 The homemade 78rpm records alone proved to be an invaluable resource. 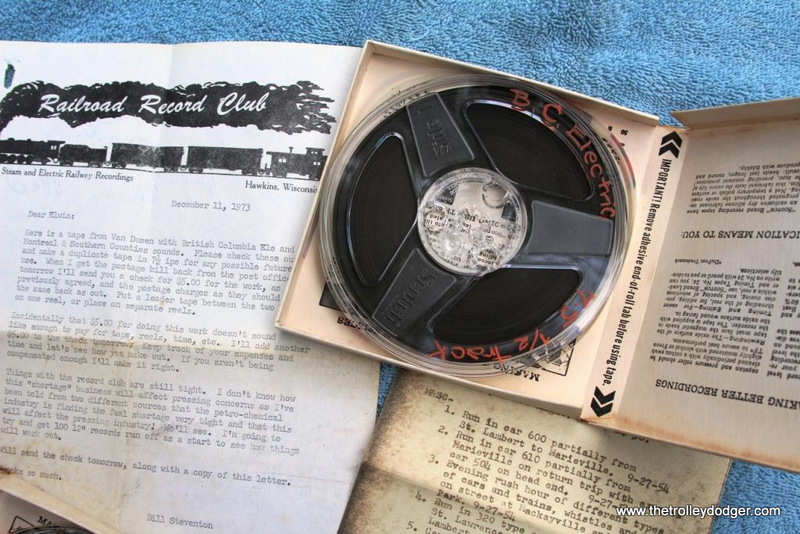 Not only did they provide us with some wonderful recordings, most of which hadn’t been heard in over fifty years, they revealed the pre-history of the club and offered a glimpse into the infancy of railroad field recording. 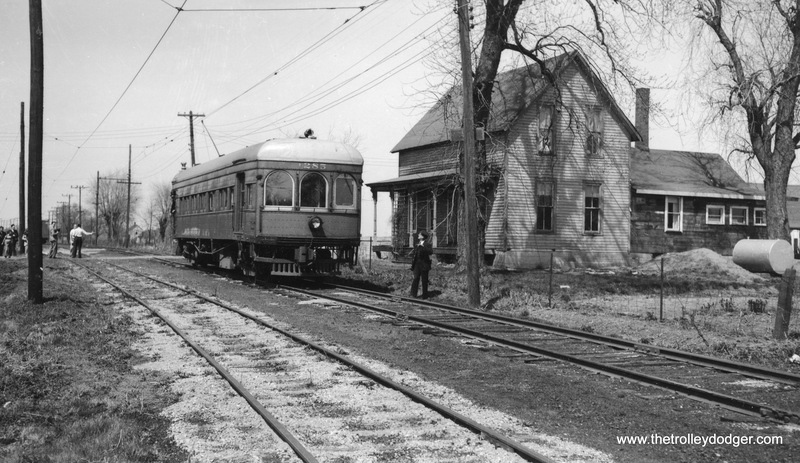 We were able to hear the very first railroad recording Steventon made– B&O trains at Riverdale, Maryland in 1953. We also finally completed our quest to get a copy of every single released RRC record digitized and put on CDs. We are now only in need of two samplers, the 5th and 6th years. 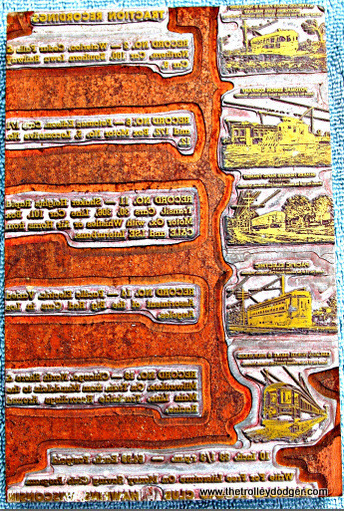 More interesting information was garnered from examining original record jacket artwork and paste up boards, as well as the metal print blocks. 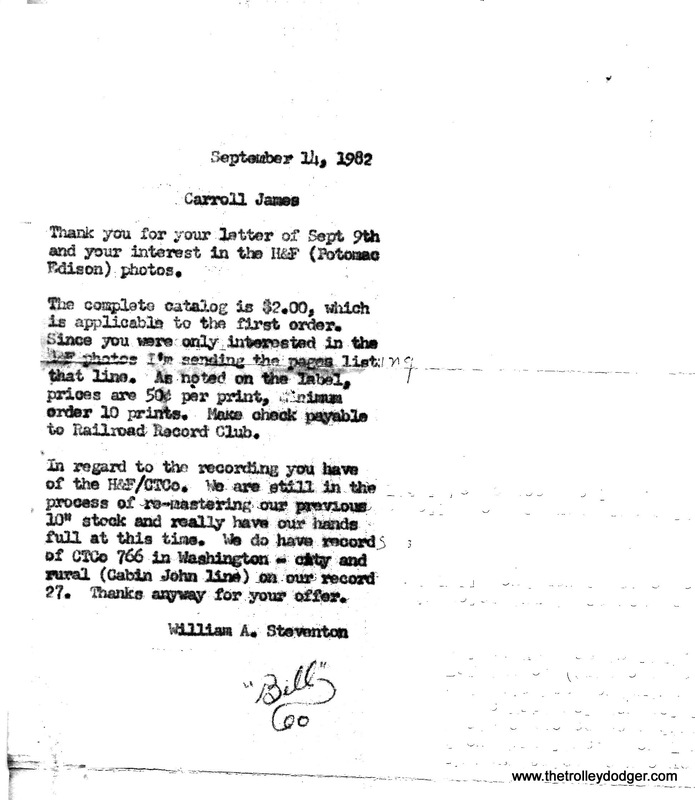 We were also able to compile a list of records re-issued on 12″ stock and find out what was necessary for it to happen and the cost of doing it. 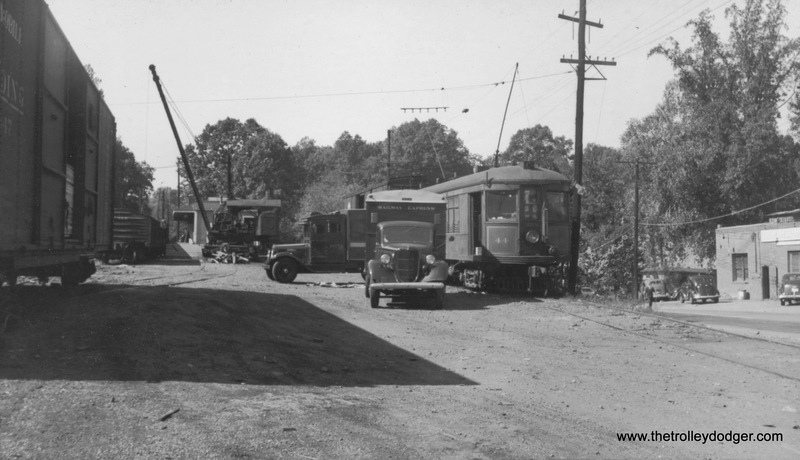 Photographs from his personal collection were scanned and published in the Trolley Dodger for all to enjoy. I think the effort that went into keeping all this material from ending up in a dumpster was well worth the time and expense and I’m happy to have been involved. In spite of this, I knew the job was only half finished. There was much more that needed to be saved and time was running out. 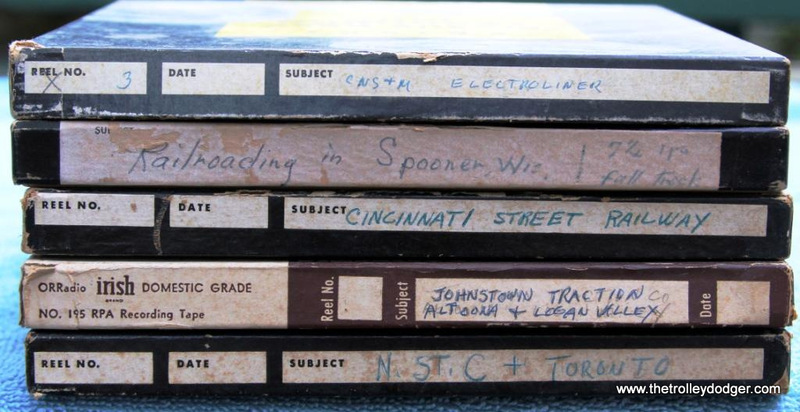 Those tapes I wrote about under the heading “what I left behind” in the first treasure hunt story needed to be preserved. There were still a big box of photos, reams of correspondence, the metal master discs for the 12″ reissues and lots and lots of sealed records. Ken, good to hear from you. Yes, it is all as we left it a year ago. There was one complication that needed to be addressed. I could not make the trip up to him in Wisconsin this year as I had done before. All the items would have to be shipped to me in New Jersey. The last box is packed. You’ll have a pallet coming that’s right around 400 pounds, perhaps a touch over. Nine boxes to be delivered to the YRC terminal. Several more delays would still be encountered, not the lest of which was the local hardware store’s forklift needing repairs. The hardware store, for a $20 fee, would be used to lift the pallet onto the truck. At last, in early September, with all hurdles cleared, a newly-repaired forklift placed the shipment on to the truck. 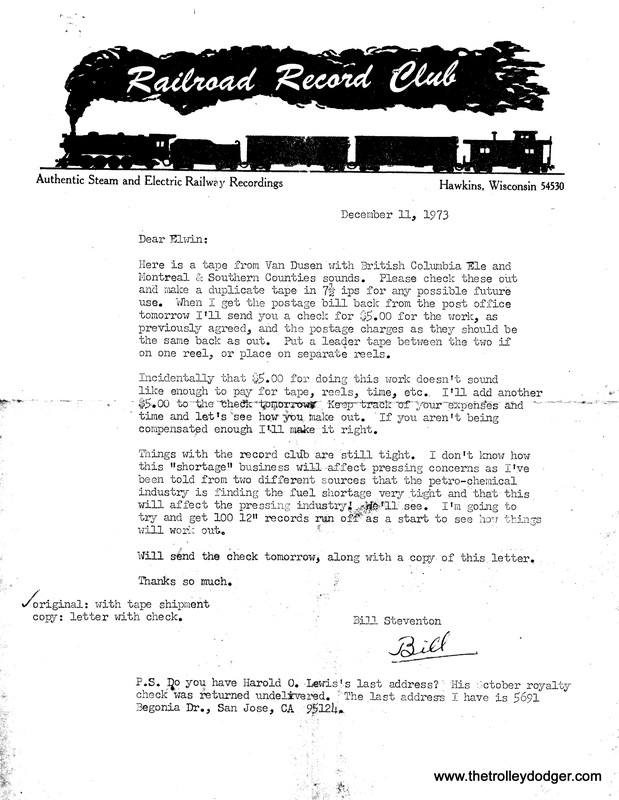 Finally, the second half of the Steventon estate’s Railroad Record Club items were on their way to me. A few days later I heading to the local YRC terminal to receive the long-awaited shipment. After some paperwork in the office, I backed a borrowed ¾-ton pick-up truck to the indicated bay. Soon a forklift lowered the last of the Railroad Record Club items from the Steventon estate into the truck bed. I now had a night of treasure hunting to look forward to! I had sort of “cherry picked” the first half of the estate, so I knew that a great unexpected find was rather doubtful, but I did come across a few surprises. 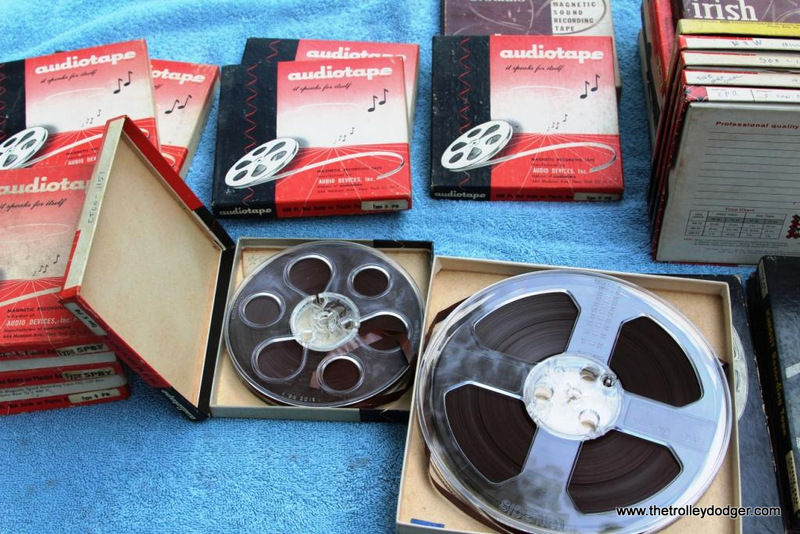 The reel to reel tapes that I had left behind last year were the real reason I went to all this trouble and expense to acquire the rest of the estate. I’m sure I did not get any of the tapes that were actually in Steventon’s recorder when he was trackside, but they may no longer exist. 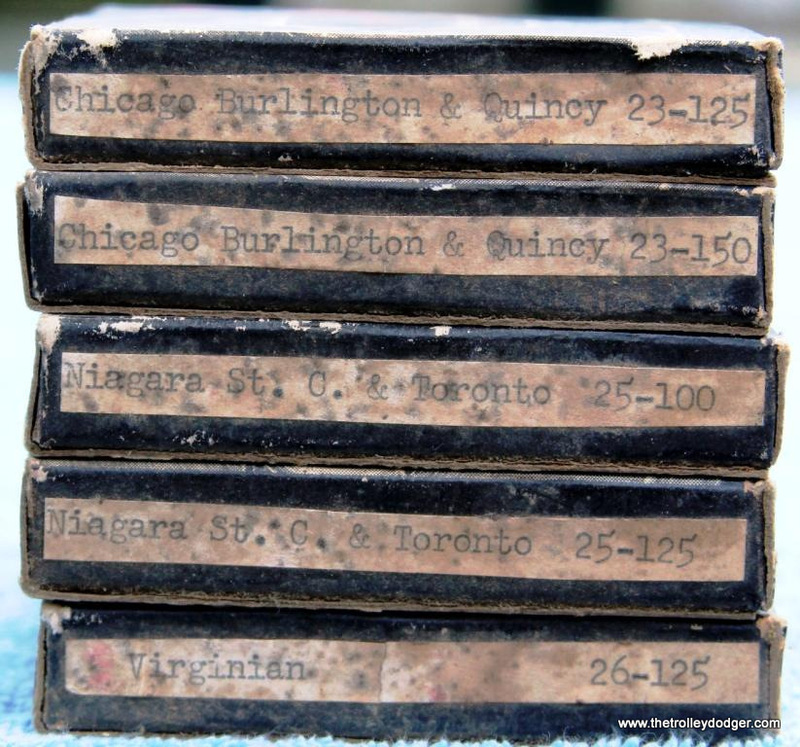 Perhaps he transferred these “field tapes” to newer tape stock, in an effort to preserve them and some of these duplicates are what I received. There is at least one recording I know he made that is not among my tapes. 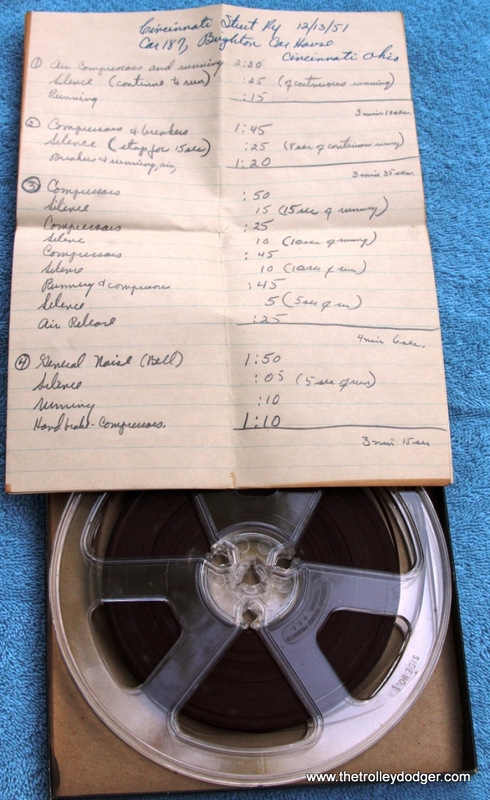 In the liner notes of Record Number 20, Steventon writes that the cab ride onboard NYC # 1441 with his father at the throttle was edited down from over two hours of tape. 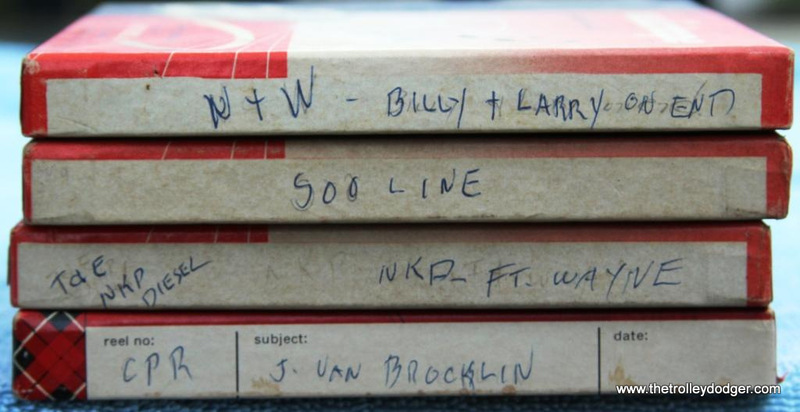 I would have been very happy to find 4 or 5 reels of tape marked “cab ride with Dad” but it was not to be. 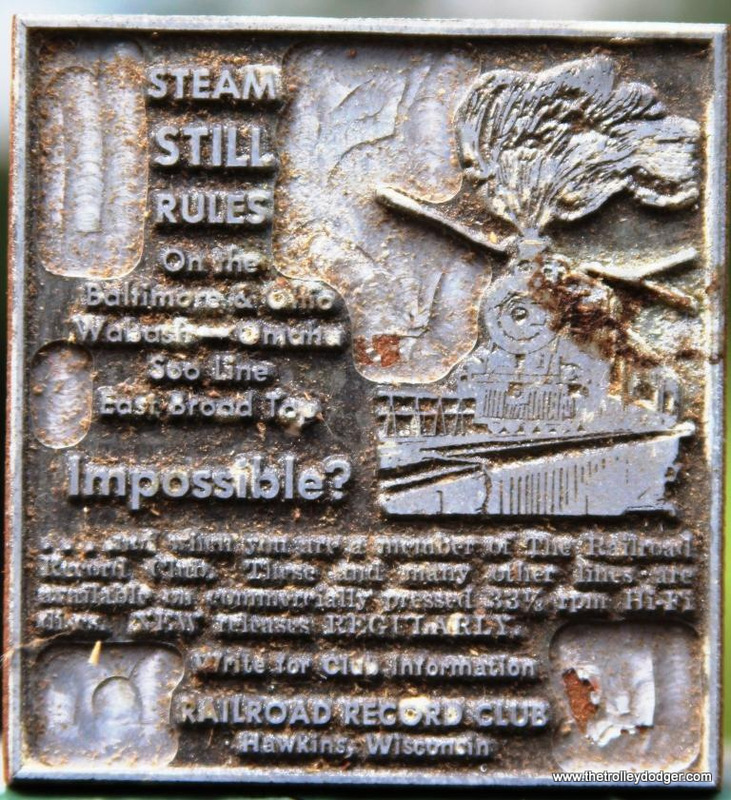 What I did find, however, is some very good and interesting stuff, most of which has never been released on a Railroad Record Club LP. 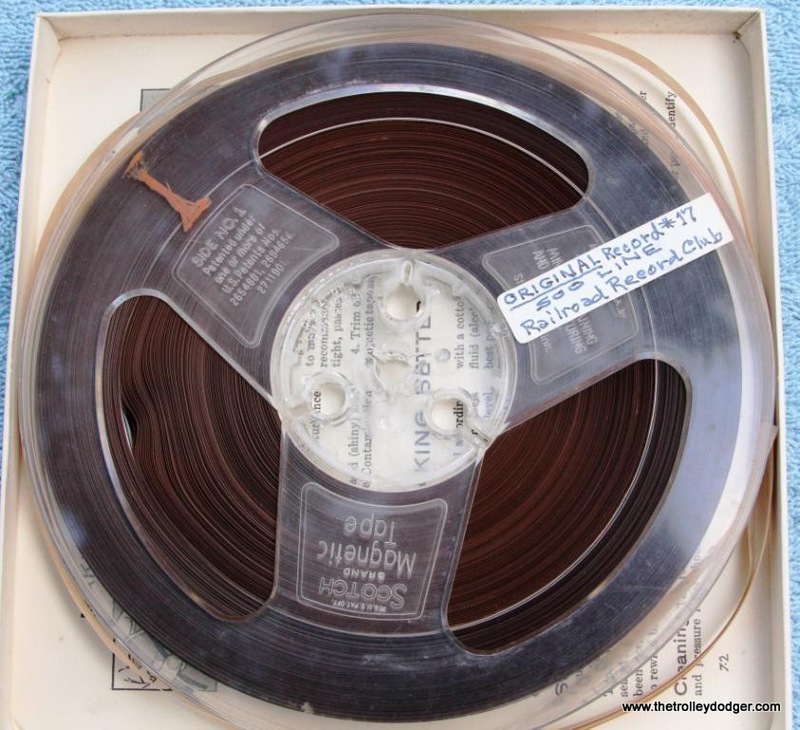 One tape that was a bit of a surprise was a 4″ reel of tape marked NYS&W. 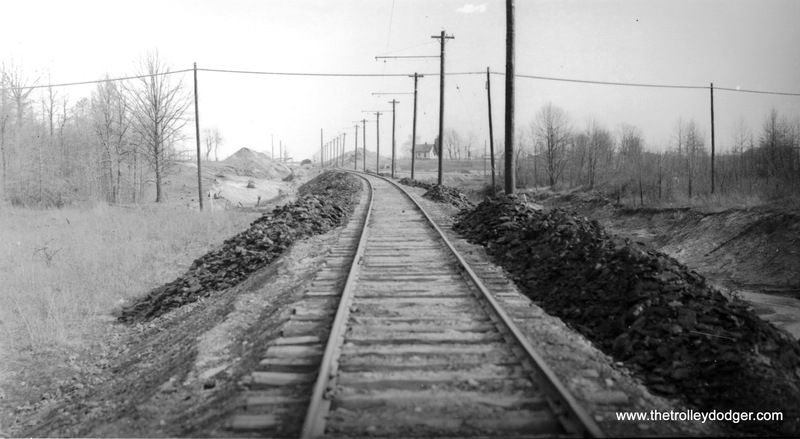 Of all the railroads in the New York area, why the Susquehanna? 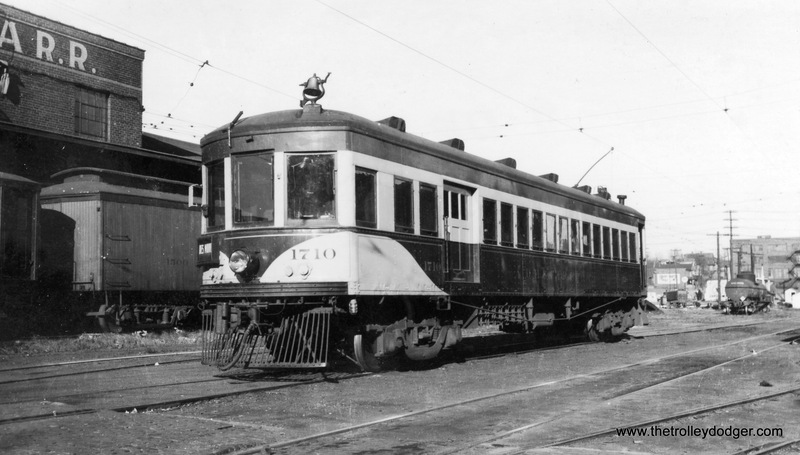 If he recorded this tape while in New York to ride and record the Queensboro Bridge trolley, which had to be prior to April 1957 when that line shut down, then why not record PRR K-4s on the New York & Long Branch which lasted until October of that year? 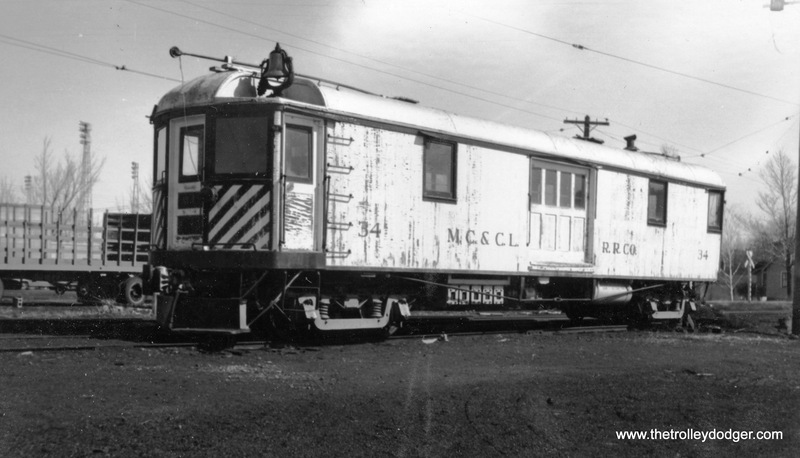 Or all those electric locomotives on the NYC and NYNH&H? 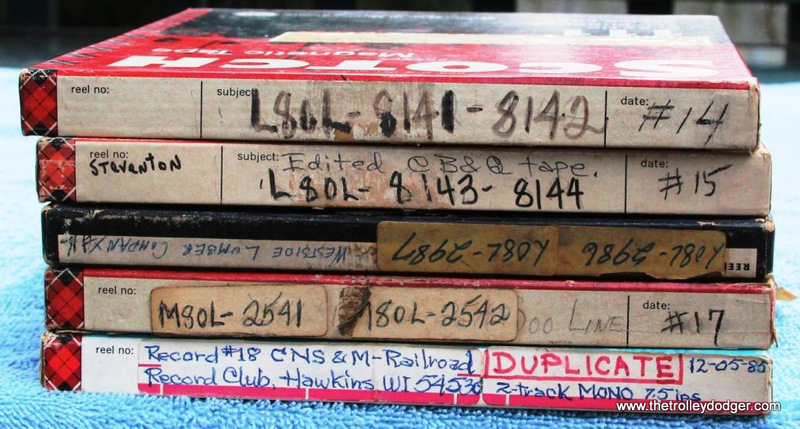 Perhaps he did record some or all these railroads and I just don’t have the tapes. Anything is possible, but I have found no evidence that he ever did. 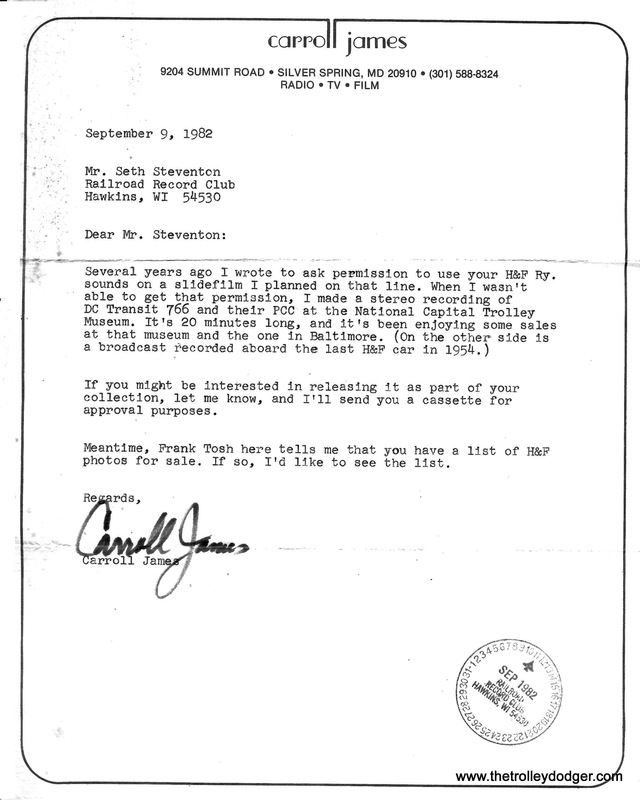 I’ll just have to wait until I have the NYS&W tape put on CD to find out just what the attraction may have been. The traction fans among us will be happy to know there is plenty for them. The CNS&M has several tapes devoted to it. 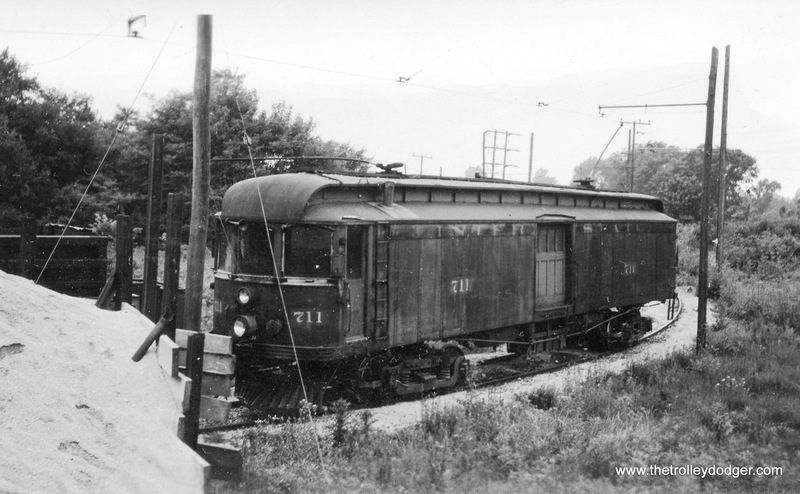 One tape is marked “CNS&M switching at Rondout and Mundelein”. 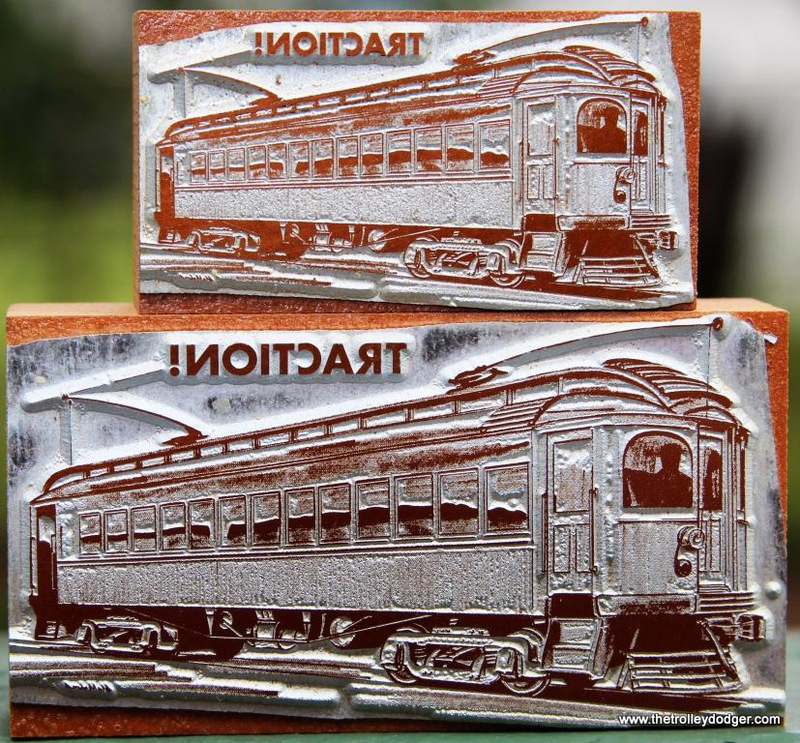 There is a cut on Record 26 of locomotive # 459 switching at Rondout, but not at Mundelein. 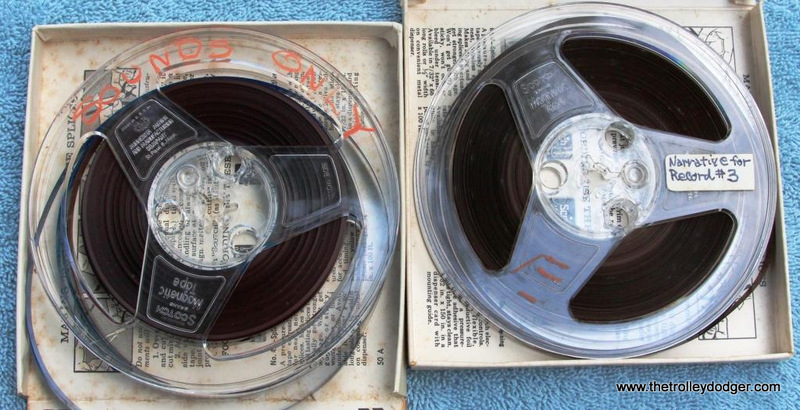 Another North Shore tape is marked “Mundelein Run” and another simply ” Mundelein”. 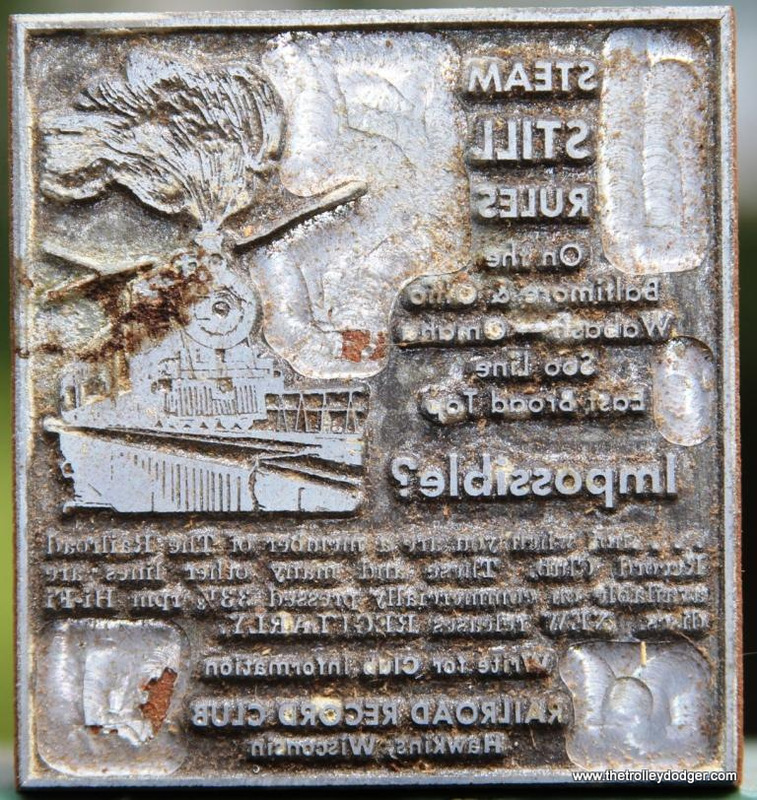 One more CNS&M tape has “Electroliner” written on the box. 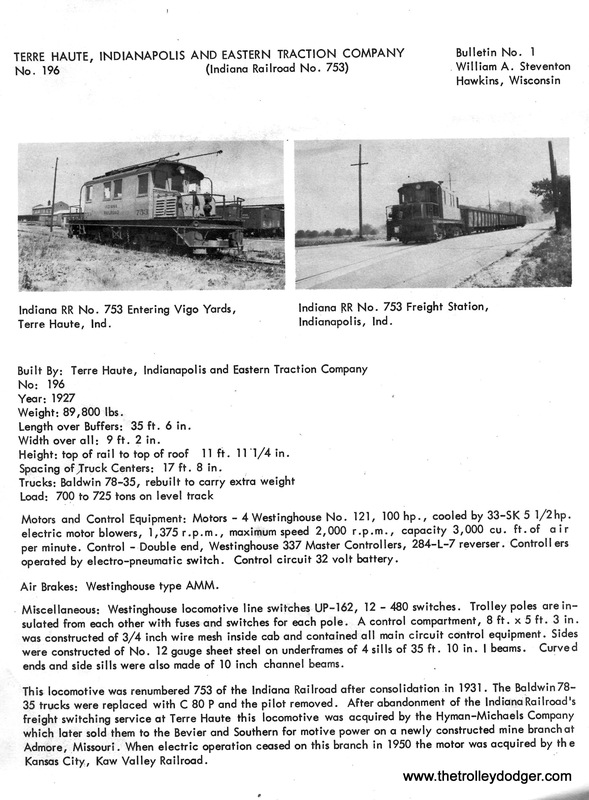 There is a tape marked “ITS 202”, apparently Steventon preferred Illinois Traction System to Illinois Terminal. 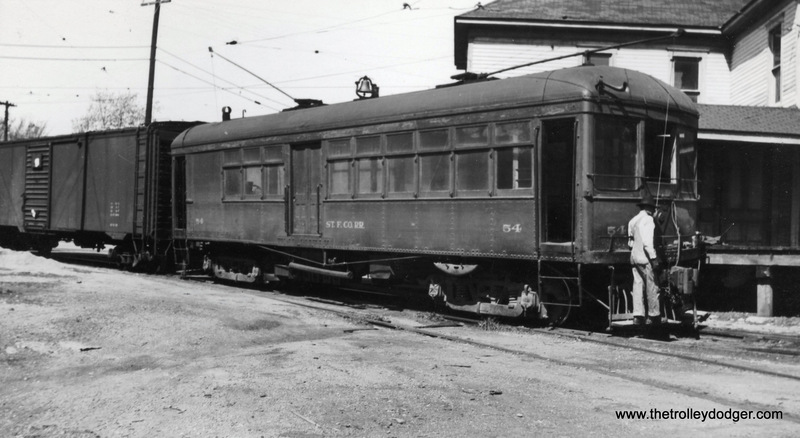 On Record 25 Steventon wrote in the liner notes, “We had just arrived (at Harristown, IL) on interurban No. 202 where we had made an “on train” recording east from Springfield. We alighted and watched the 202 fade into the distance. 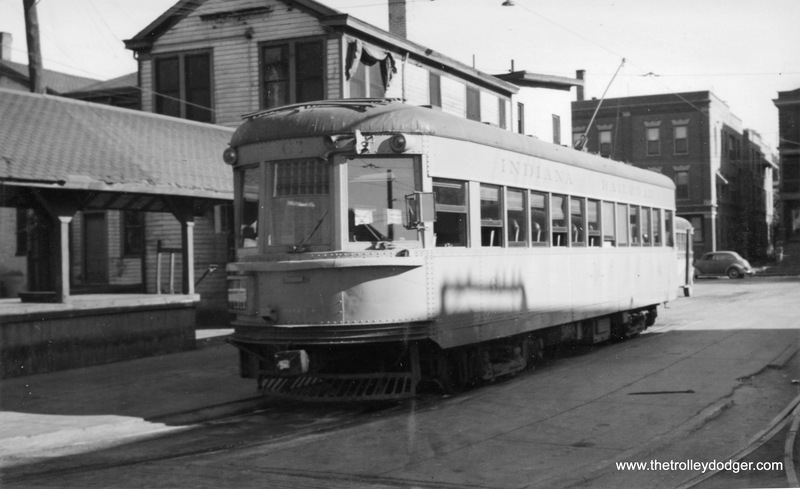 This was the last sight and sound we had of the Illinois Terminal as an interurban. 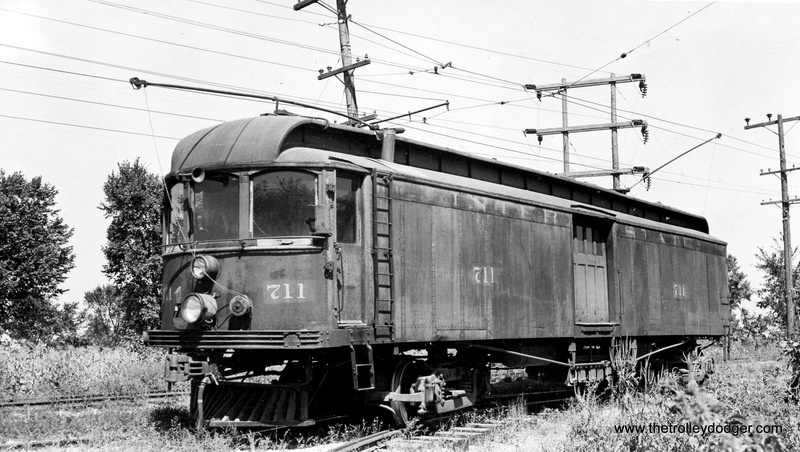 The “on train” recording of 202 and a streamliner is scheduled for release at a later date.” It never was. I don’t know about the streamliner recording, I may or may not have it, but I will consider it a privilege to be involved with releasing the 202 recording for him. There are also tapes of the Cedar Rapids & Iowa City (CRANDIC), Charles City Western, Toledo & Eastern, and Capital Transit. Canadian traction fans are not overlooked either. 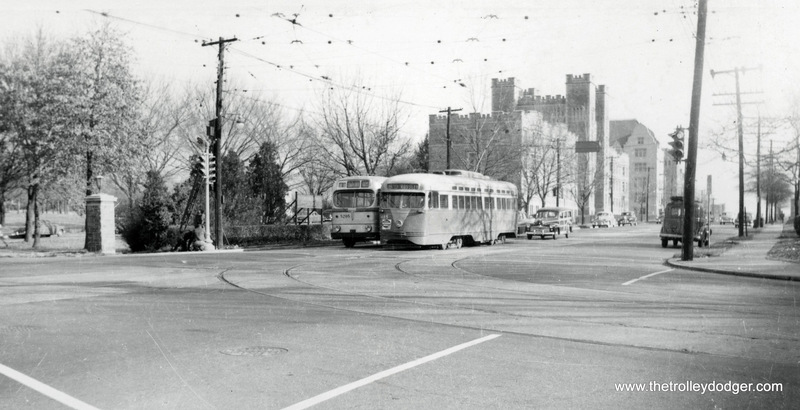 There is a 5″ reel of the Niagara, St. Catharines & Toronto Railway. 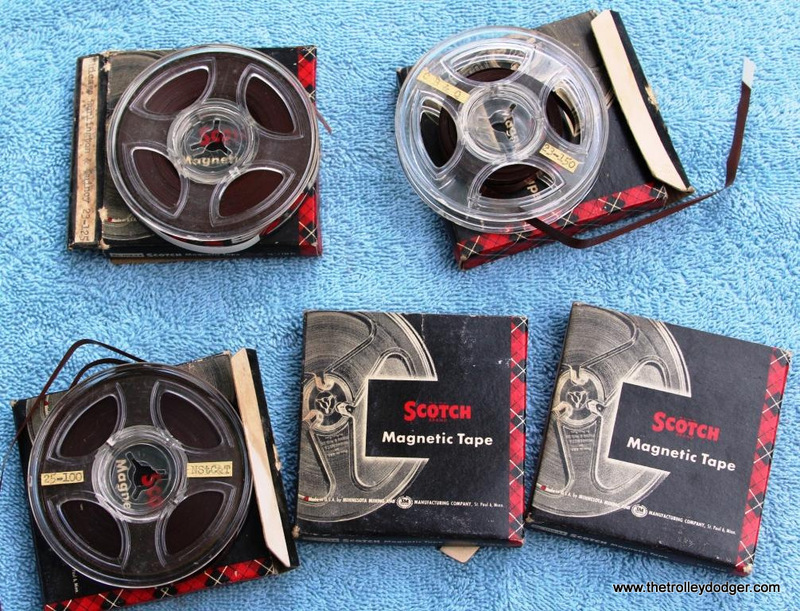 There are also two 5″ reels, one each, of the BC Electric and the Montreal & Southern Counties. 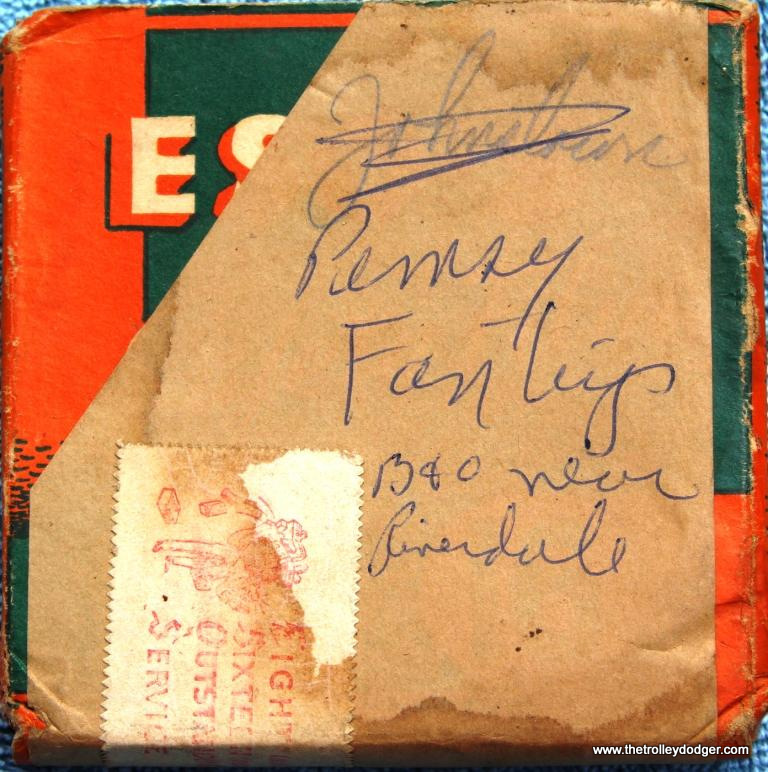 These two tapes were recorded by Eugene Van Dusen, and the accompanying letter to Steventon, plus a copy of it sent to Elwin Purington, were found among some RRC papers I have. 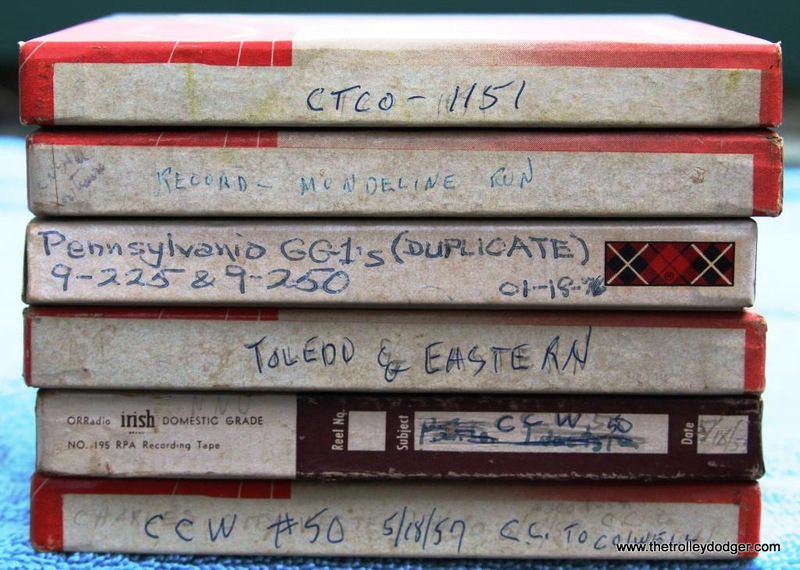 Another reel of tape not recorded by Steventon is “Cincinnati Street Railway Car 187 12/13/51.” Finding this was a nice surprise. 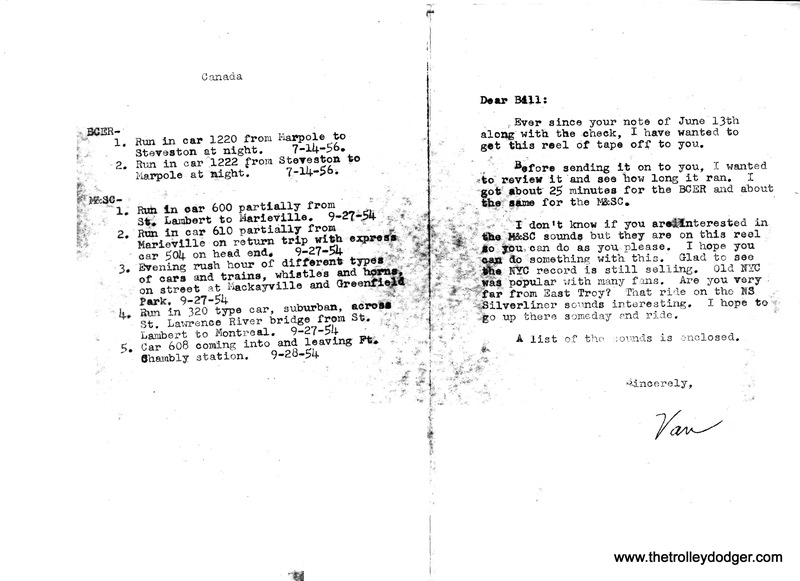 I don’t know who did record it, but Steventon did not start making recordings until 1953. The next bunch of tapes are smaller reels. 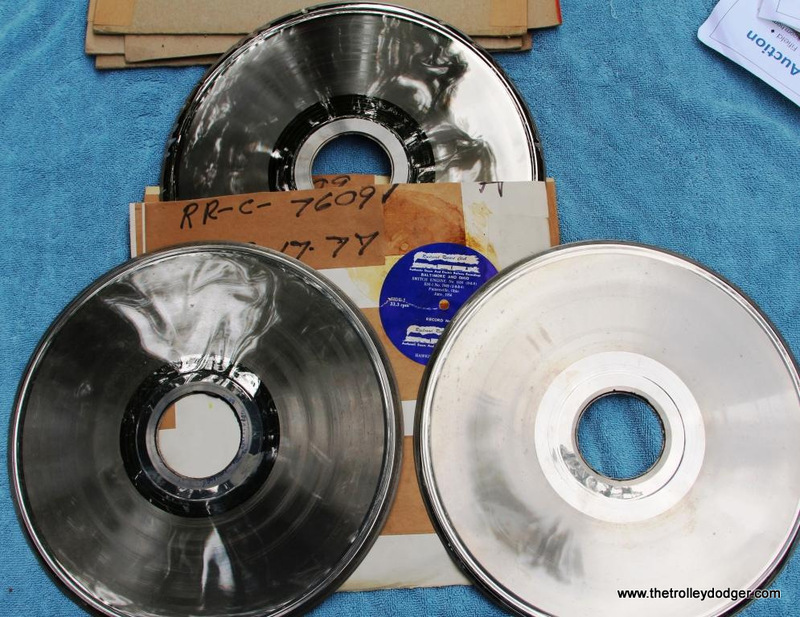 These 21/2″ reels are in their original manufacture’s boxes and are marked only with a Railroad name and a catalog number. 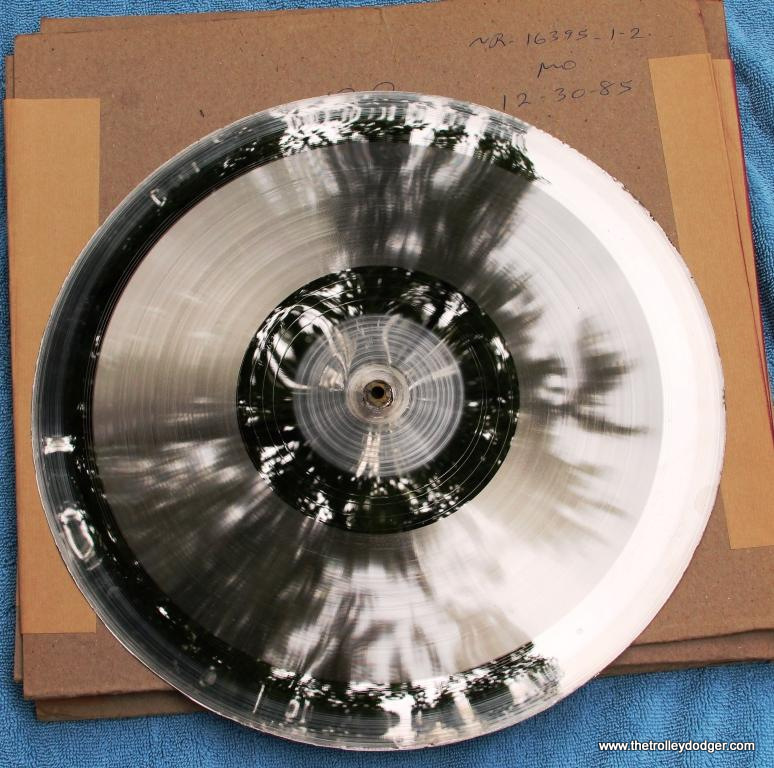 The catalog numbers correspond with the catalog numbers on the 10″ 78rpm acetate records that I acquired with the first half of the estate. As producing these records was a very time-consuming task, Steventon saved time by making a master tape for each record. 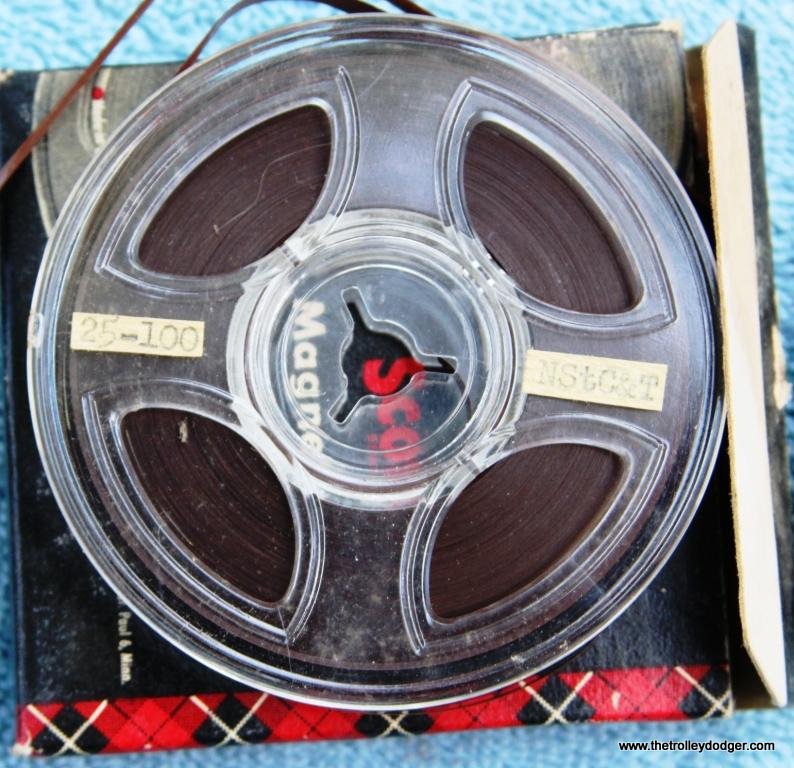 The master tape would contain his spoken introductions followed by the train sounds. 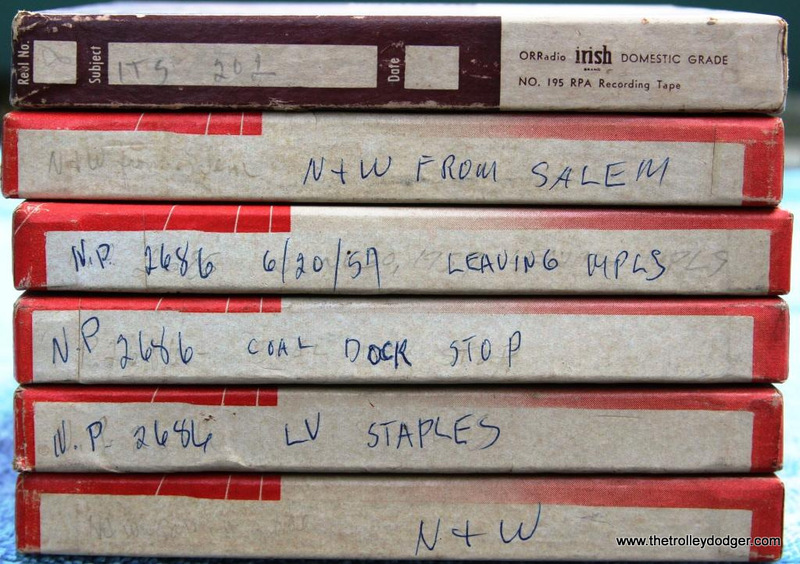 I bought over sixty of these small master tapes, and a large number have never been put on the regular Railroad Record Club releases. 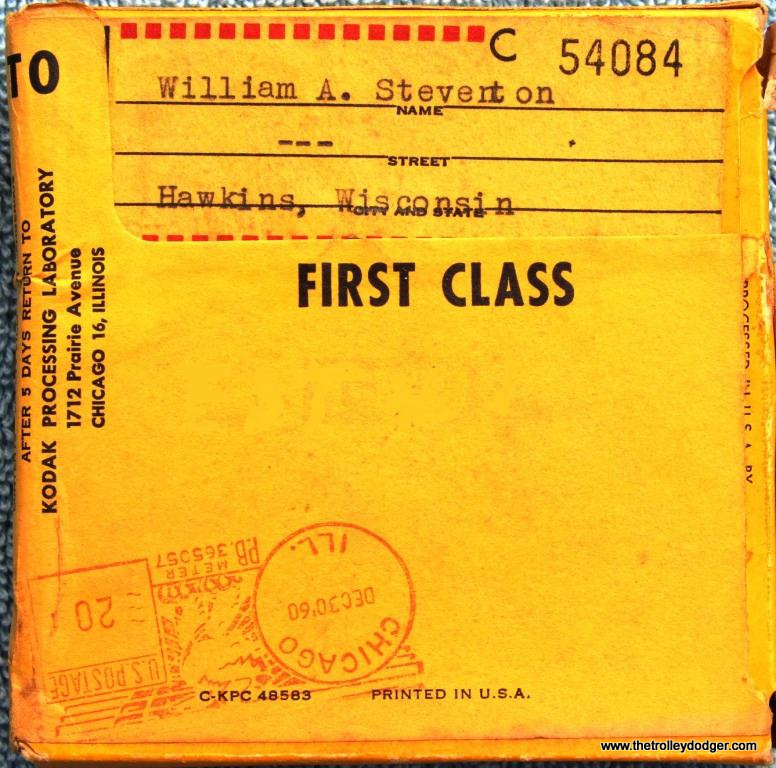 They contain sounds of railroads I was completely unaware Steventon ever recorded, such as L&N, Southern, and Virginian. 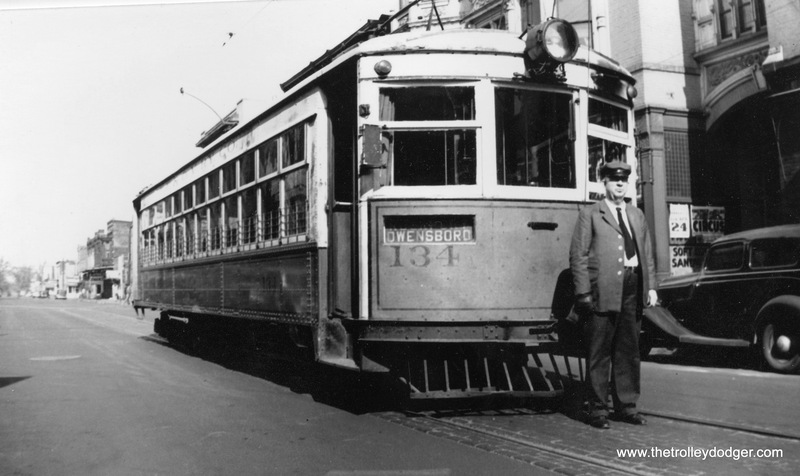 This collection also contains the Queensboro Bridge trolley, the IND subway, and the Third Avenue EL recordings Steventon made in New York City. 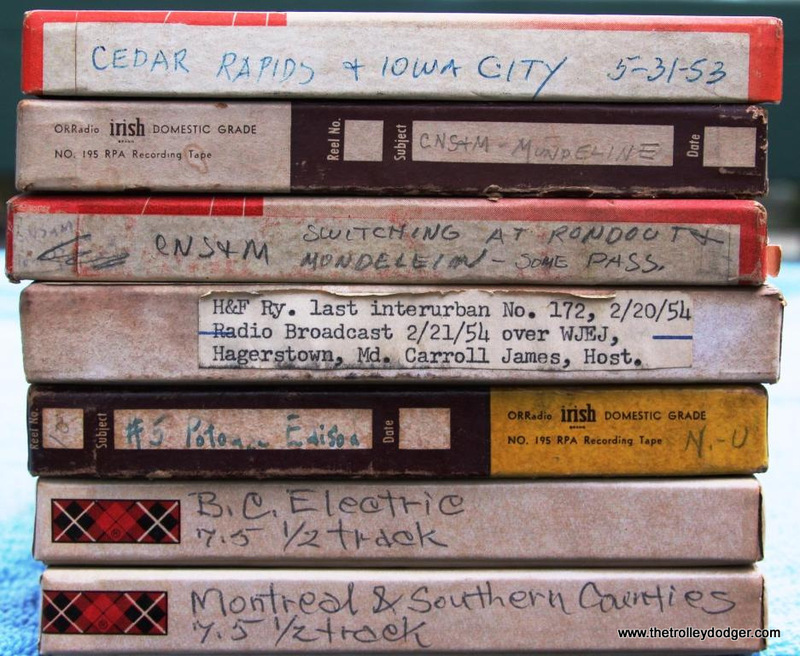 This is not a complete set of all the master tapes made for the 78rpm records to be sure, but it’s most of them. I consider it a small miracle that any survive at all! 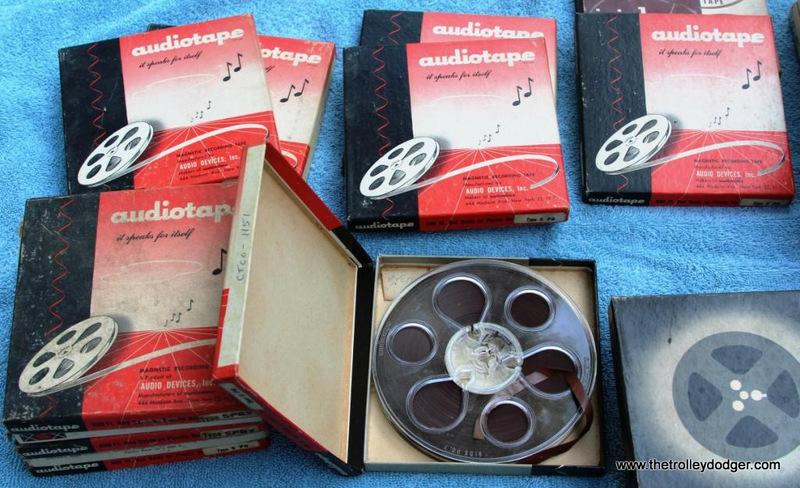 I am not an audio expert, but in my opinion, uninformed as it may be, these tapes appear to be in reasonably good condition. 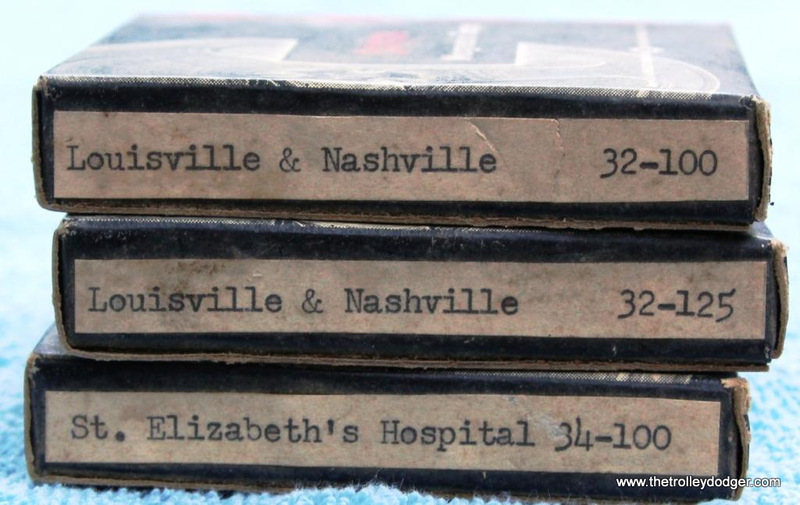 I would think that the tapes would be able to withstand a few more plays, enough to be digitized at least. Neither David nor I have the equipment to attempt this and I think it would be ill advised of us to try anyway. 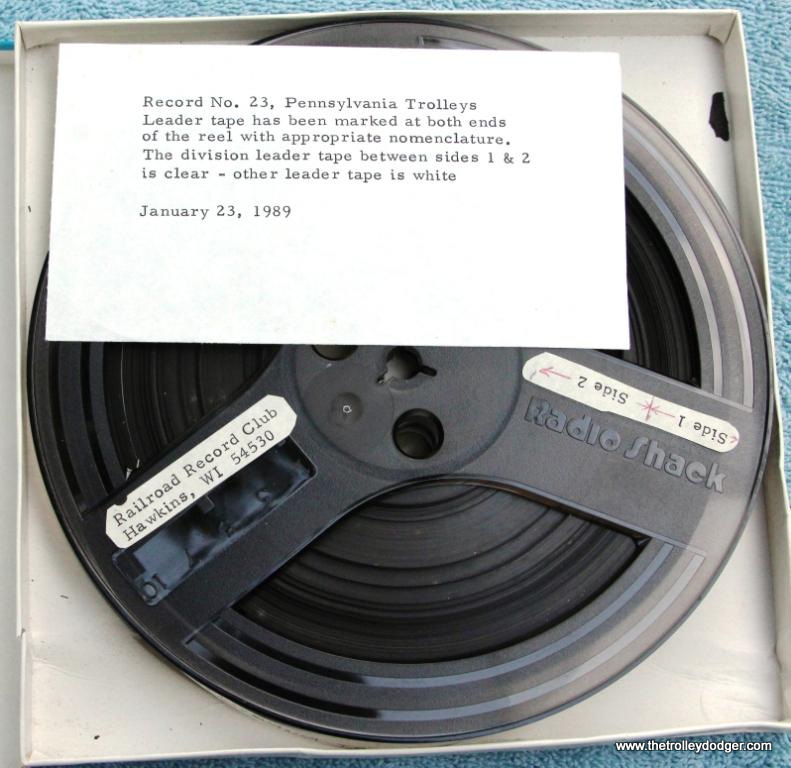 The tapes are old and were not stored in archival conditions. I’m sure the prudent course of action is to entrust any work on them to a professional. 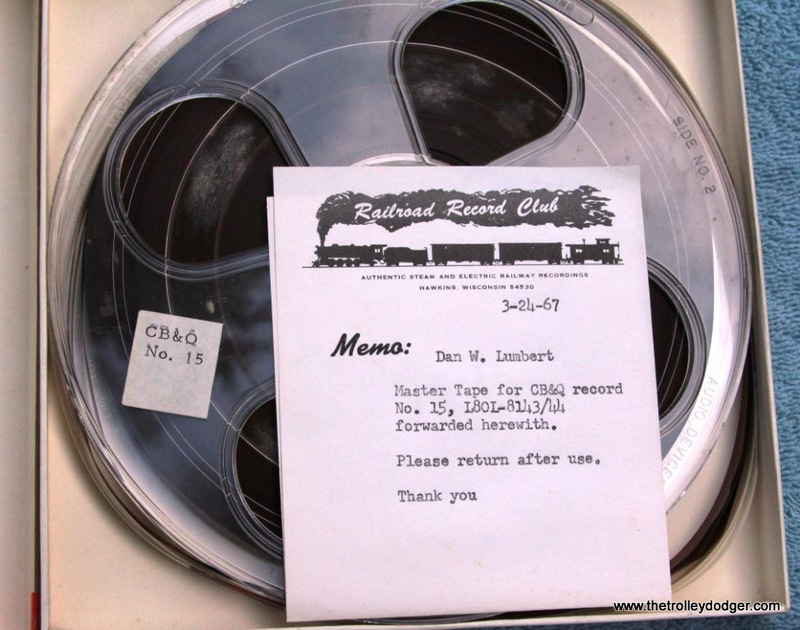 The last batch of tapes are the master tapes made for the released Railroad Record Club LPs. 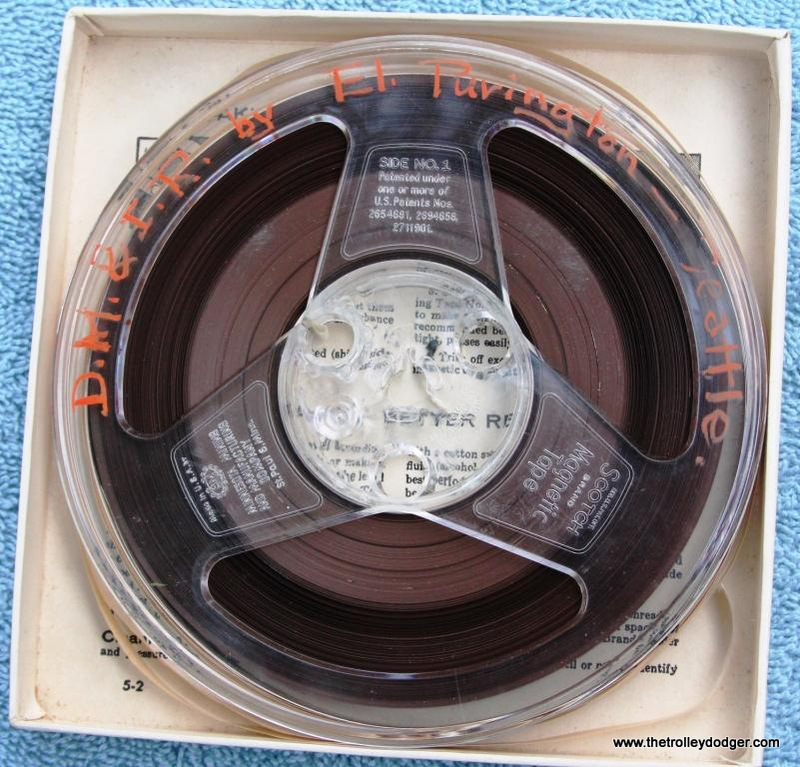 There are different size reels, some tapes are only of one side of the LP while others have both sides on the same reel. Some are in good condition and some are not. 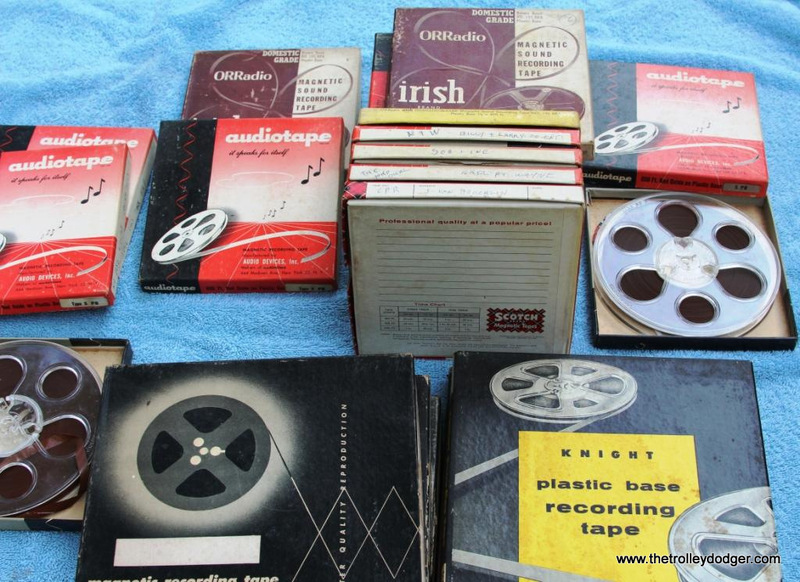 Some I have multiple copies of and a few of the LPs I have no tapes for, Rather then make a complete list of every reel I will simply list the few LPs I have NO master tapes for. Most of these reels are 7″ with only a few smaller or larger. 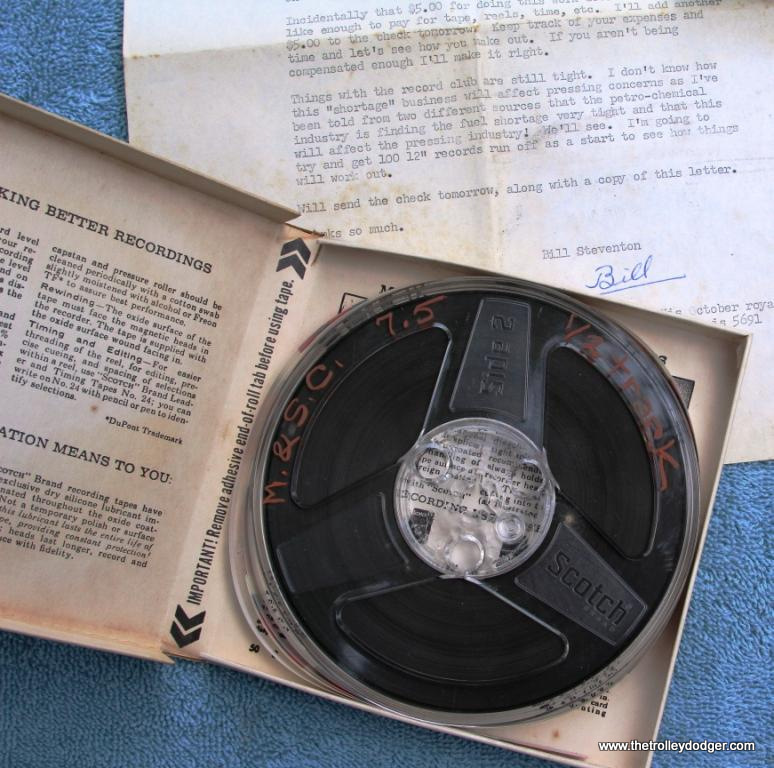 The most interesting master tapes are the reels for RRC 3 EBT/D&RGW. 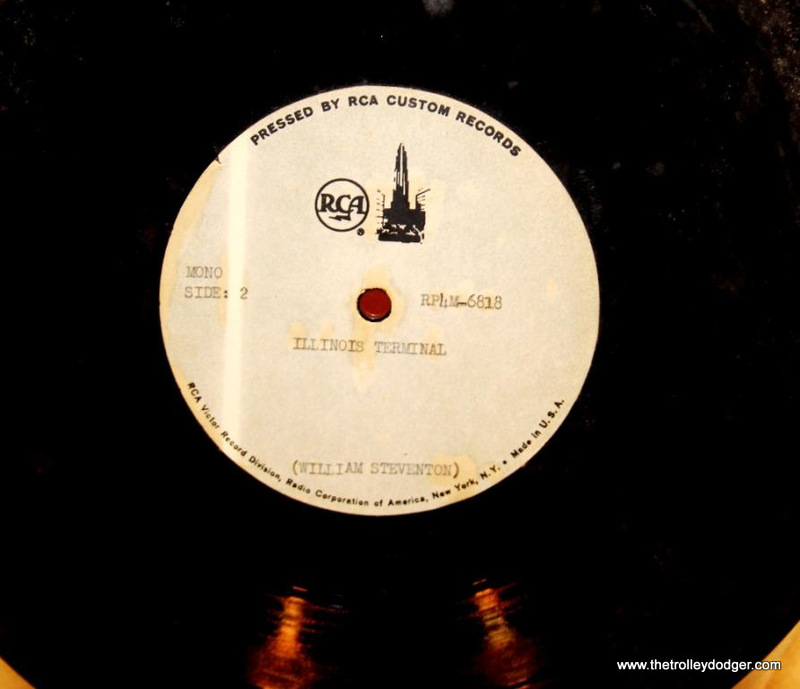 There are two 7″ reels that most likely have the original release version of the record, the one with William Steventon’s narration. 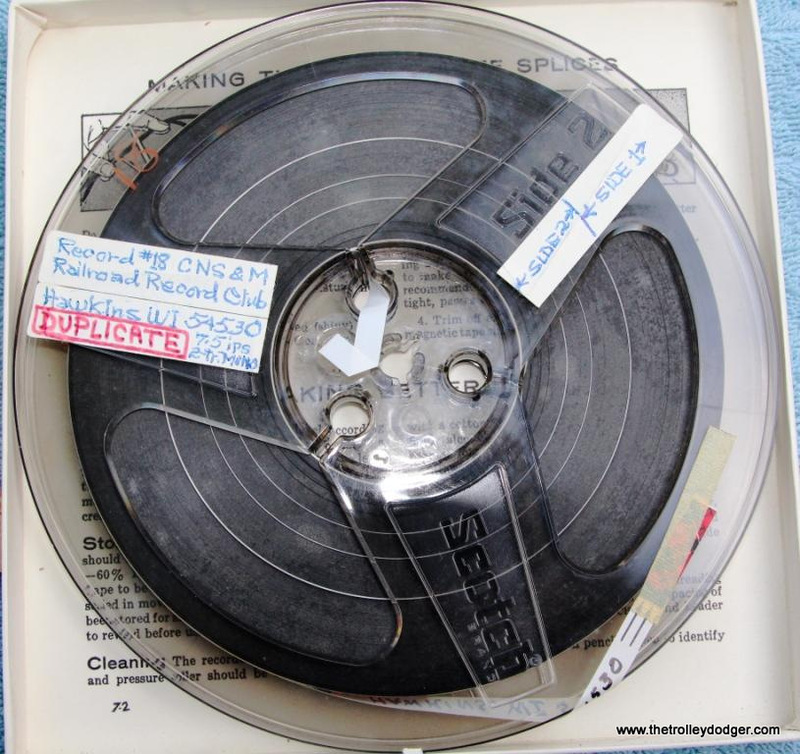 There are also two 5″ reels, one marked “sounds only” and the other labeled “Narrative.” Since Steventon removed his voice from the 12″reissue of the record, the “Narrative” tape must contain just the voice of Elwin Purington doing the new narration. I’m not sure just what to do with these master tapes. 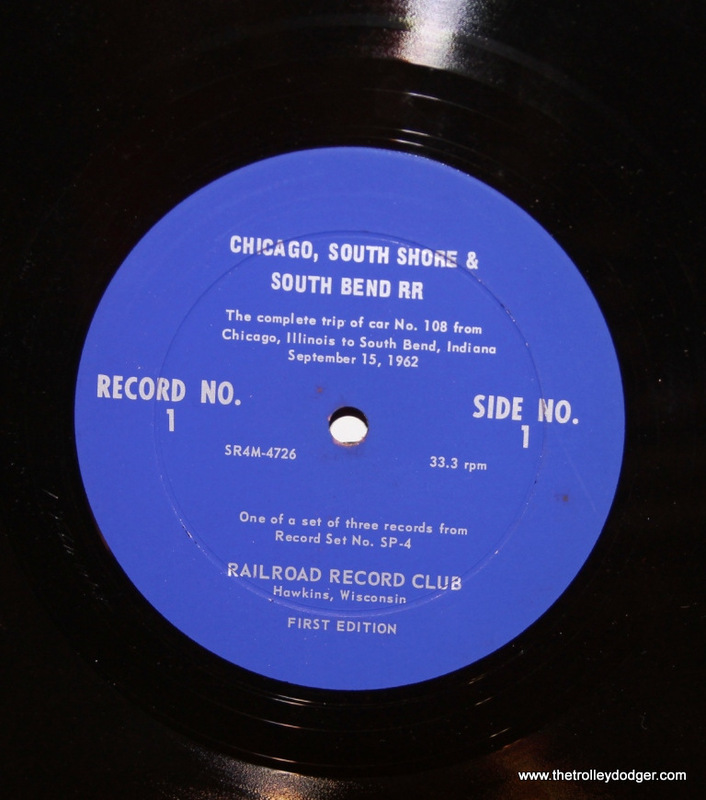 Some are in rough shape and all these sounds are on the released Railroad Record Club LPs. 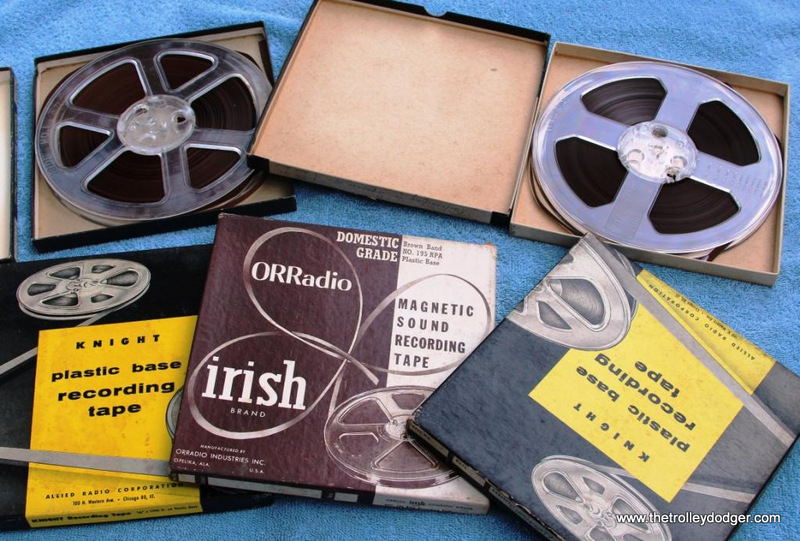 It certainly would be a considerable expense to digitize them all and no new sounds would be gained. For now, I’ll store them in the best possible conditions that I can provide and perhaps one day a clear path of action will present itself. 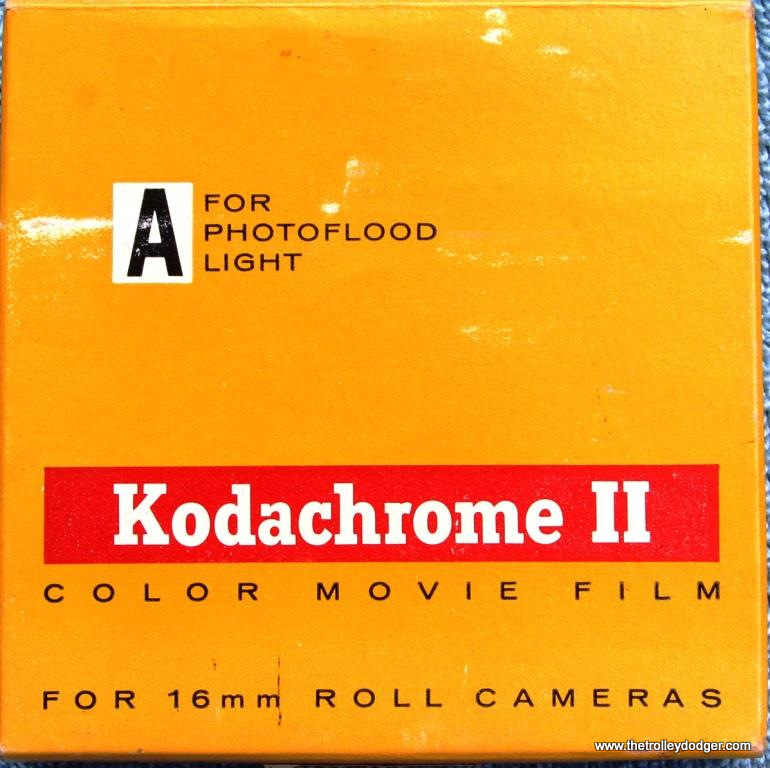 I found several rolls of 16mm movie film within the boxes of audio tapes. Fortunately, Steventon was very good at labeling everything. 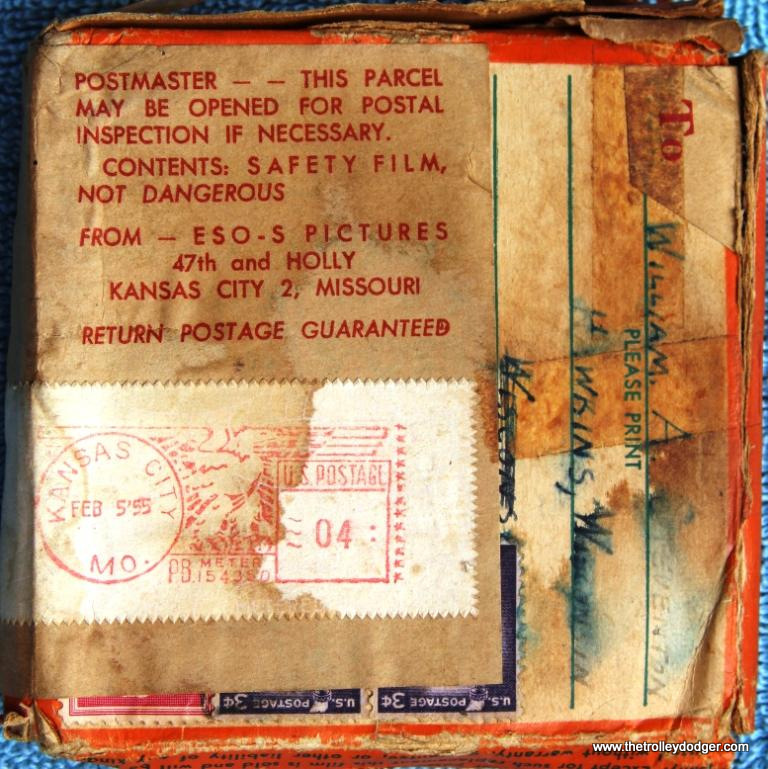 He inserted little slips of paper into the film boxes listing the contents of the films. Unfortunately, the majority are family home movies. Most are of Steventon’s son Seth. His first day of school, Christmases, and birthday parties. 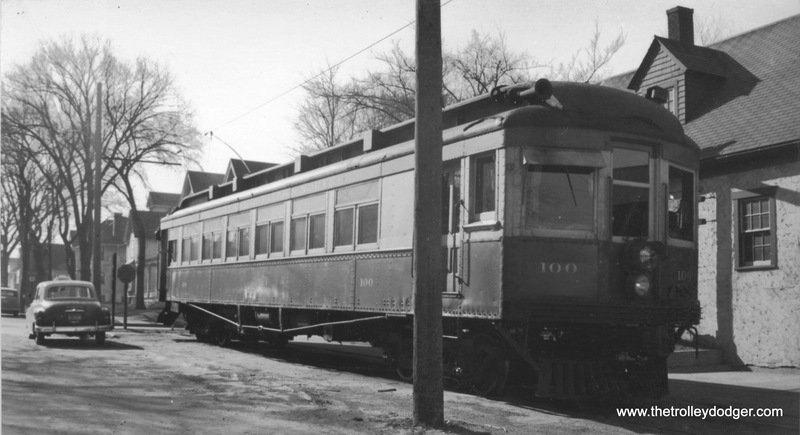 There were six 100-foot reels that should be all trains. 2. 100-foot reel, full, labeled “Canada Term”. I’m not sure what that is supposed to indicate. I unspooled a few feet of film and the first few frames are without a doubt a steeple cab locomotive. 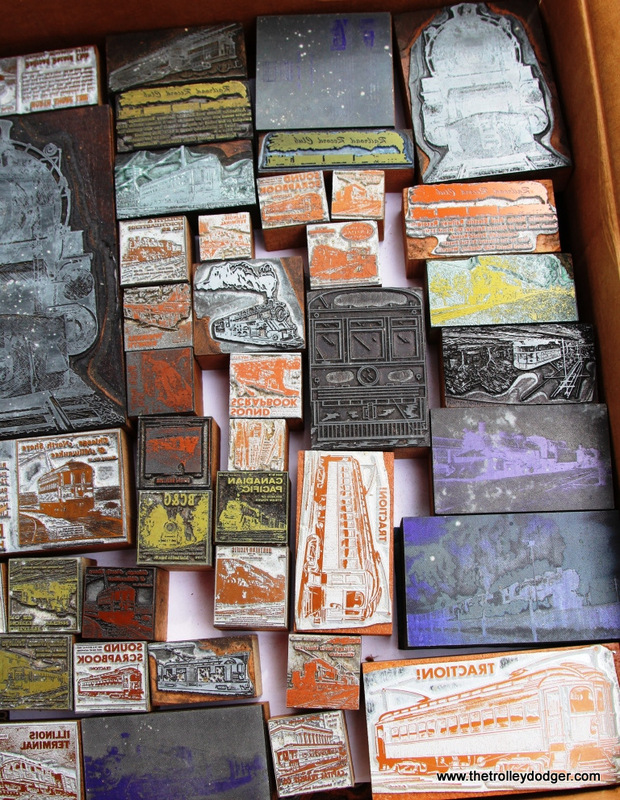 I also acquired a good number of print blocks, which are mostly quite small and were used in the RRC advertisements. 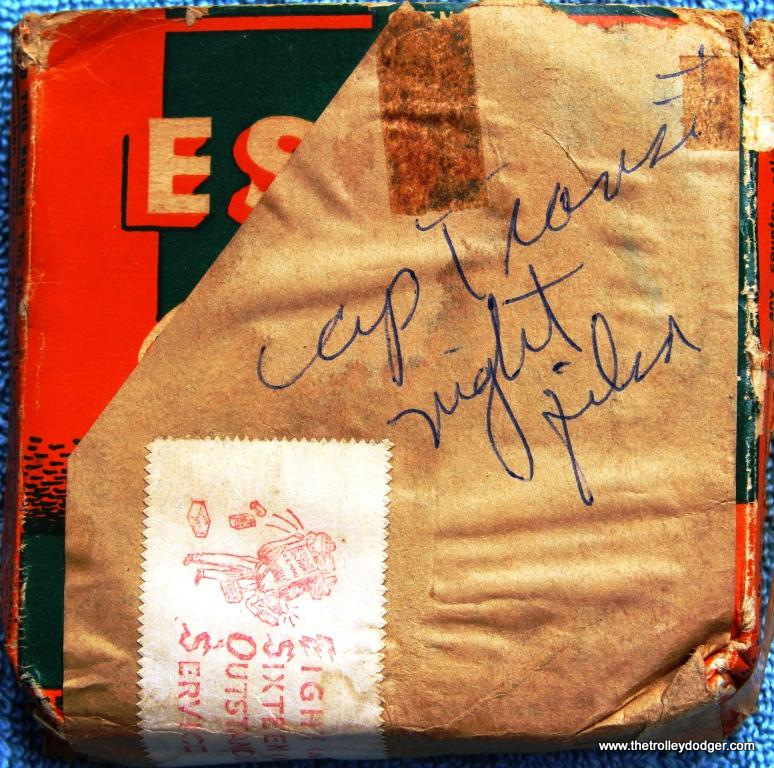 I have a bunch of print blocks of the LP covers, all about the size of a postage stamp. They were used in ads and in the catalogs. There are a few complete ads that mostly feature a single record release. One large ad of interest is a very 1960’s, almost psychedelic illustration of a steam locomotive looming over a record player. Smoke is shooting from it’s stack and entwined within the billows of smoke are such things as a whistle blowing, a box cab electric locomotive, and a steam train. 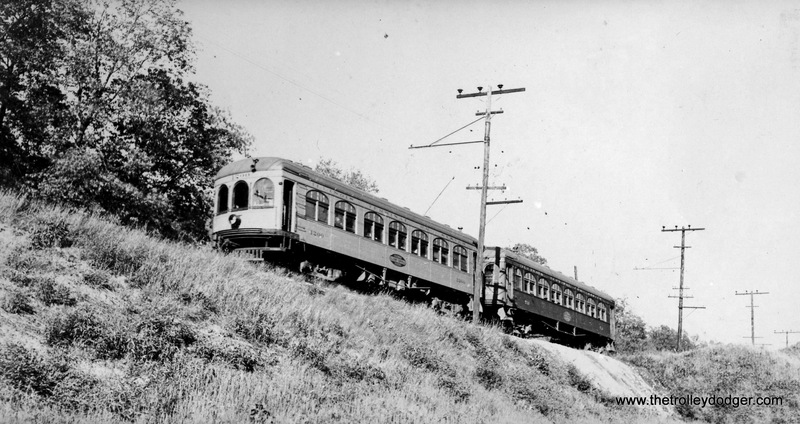 LPs are seen flying through the air and the words “steam and electric recordings” in twisted snake-like lettering fills the upper portion. Wild and unexpected. I would certainly like to know if this ad ever appeared anywhere in print. 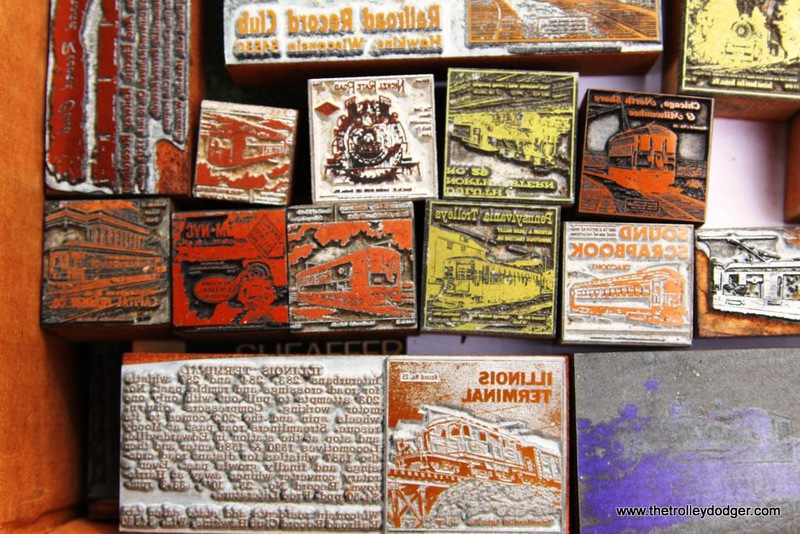 I did not make a list of these small print blocks, there are just too many. I did photograph a representative selection of them. These photos will give a good idea of what is in the collection. Since the estate dealer would only sell me the tapes unless I bought the entire lot, including the remainder of the RRC LP stock, I had no choice but to buy them. I’ll admit I would not have wanted to see all these mint condition, still sealed LPs go in the trash, but what am I going to do with them and where am I going to store them? These questions I’m still contemplating. 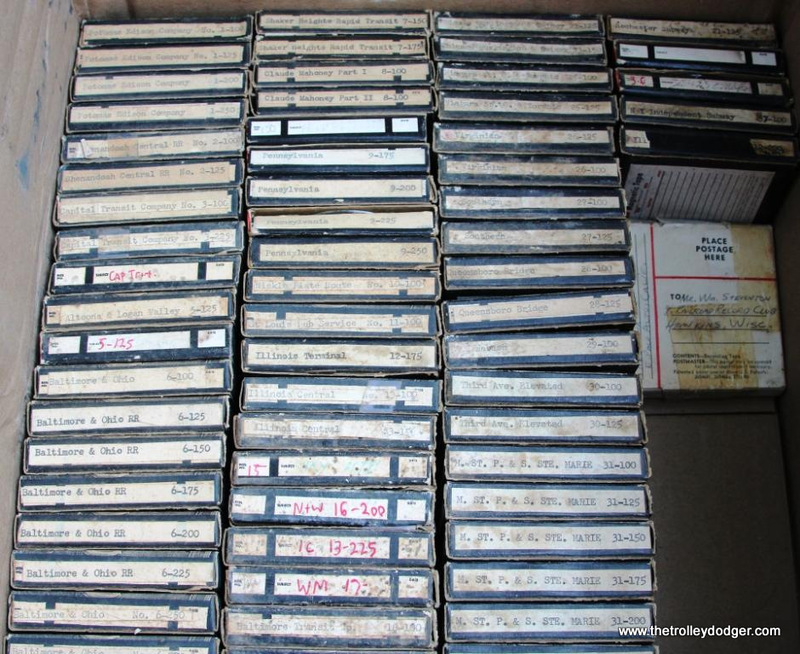 However, these concerns are secondary to preserving and digitizing the tapes. I have a few options, I can rent a table at a few railroadiania swap meets, contact a few local hobby stores and see if they are willing to sell some, and David and I have been thinking of making them available through the blog. I’ll have to carefully consider my options. 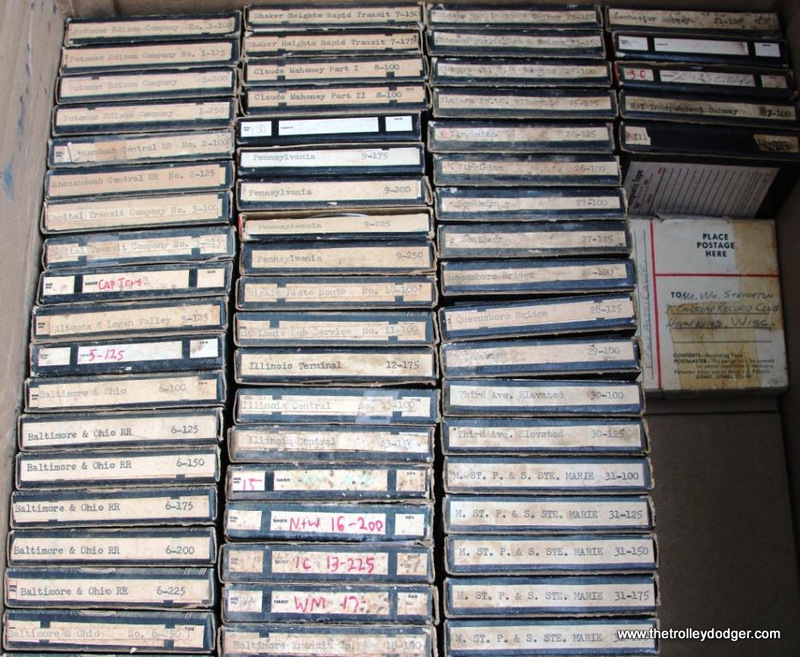 It would be nice to make a little of my money back and put it towards digitizing tapes. For the record, here is a list of the 12″ remasters. They are all still sealed and, for the most part, in mint condition. A few may have a bend or crease in the jackets and a few copies of RRC 20 have brown water stains in the lower right corner. 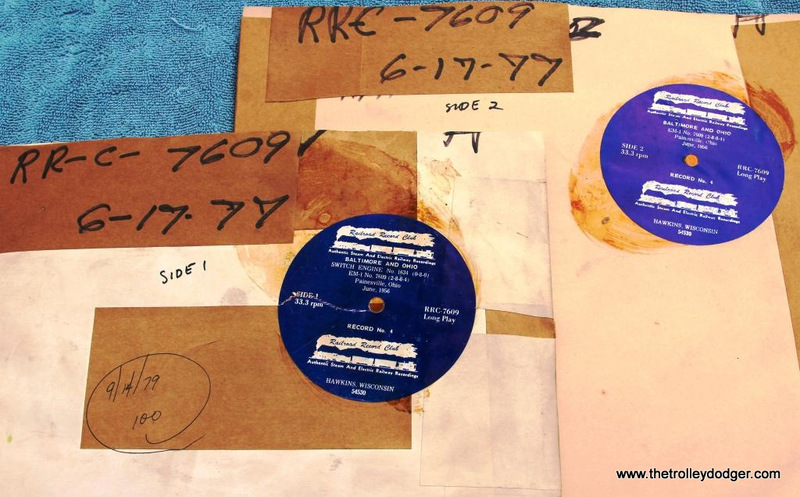 Twenty-four RCA test pressing were included in the sale, ten 12″ pressings and fourteen 10″. 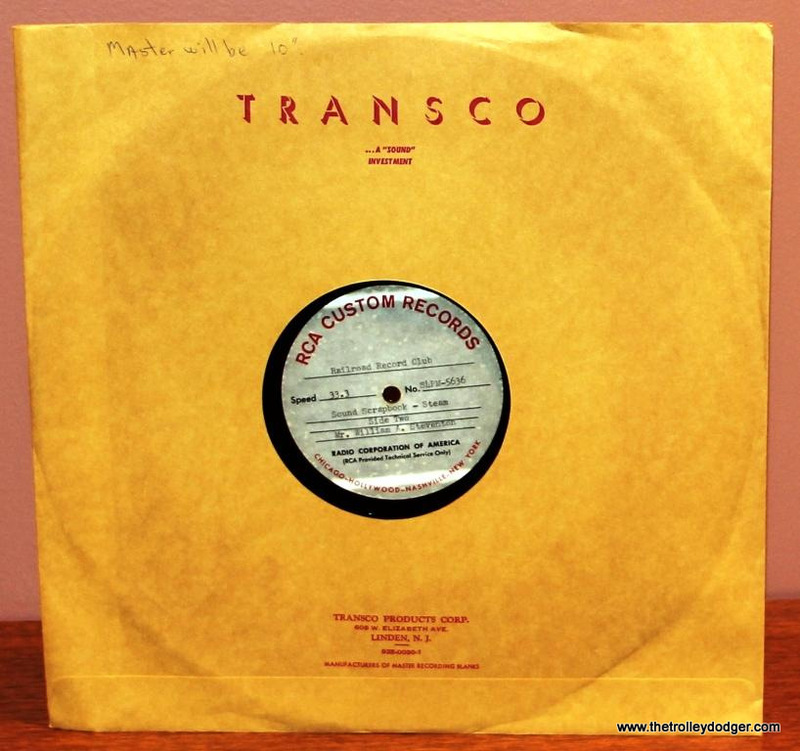 All these pressings are stamped on one side only and on the paper sleeve of two of the 12″ pressings there is a hand-written note: “Masters will be 12 inch”. This is the one rather disheartening part of the story. All but three of these test pressings are in very poor condition. The accrete has flaked off in large chips. 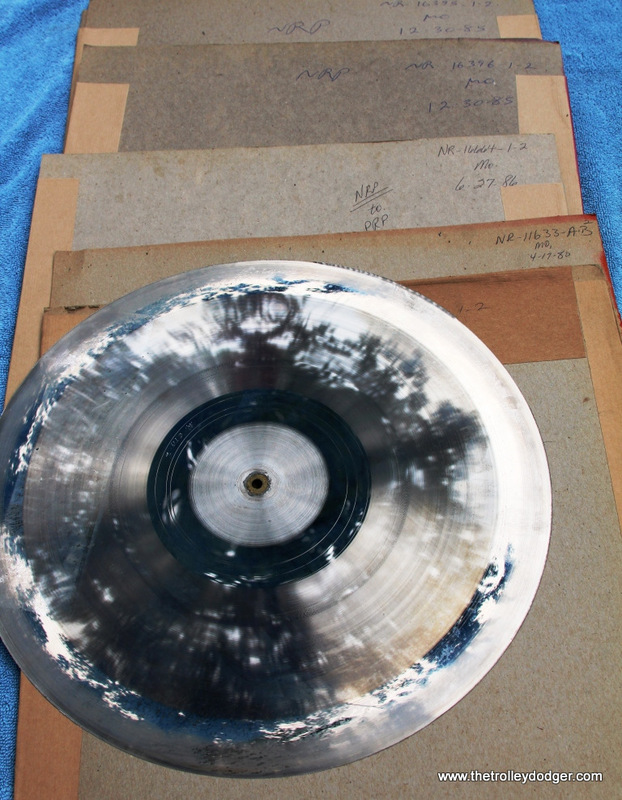 When I removed the disc from the paper sleeve to determine its condition, a black snowfall often resulted. I’m not sure what to do with these, they are really just trash now. I will photograph the label of each one for my archive but after that, I just don’t know. 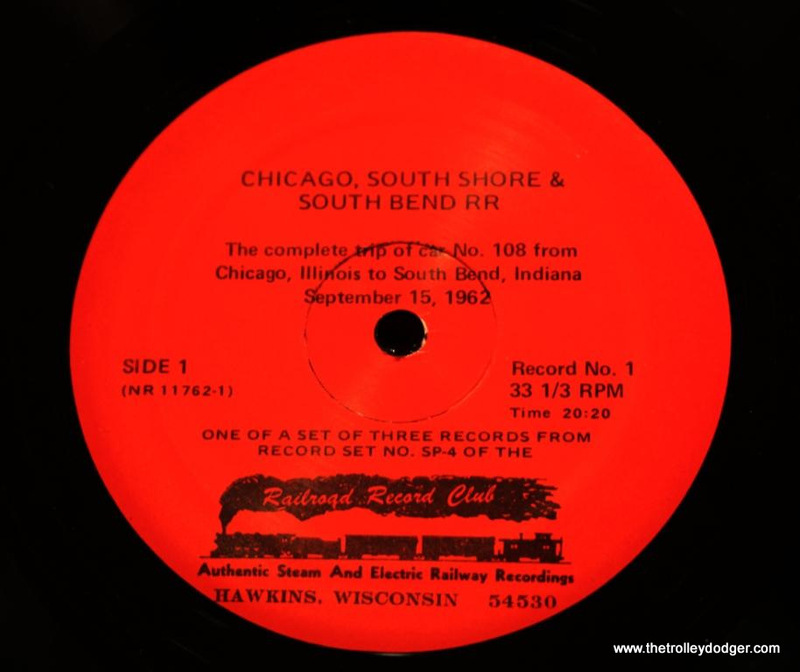 The three good discs are two 12″ pressings for both sides of RRC 15, CB&Q. 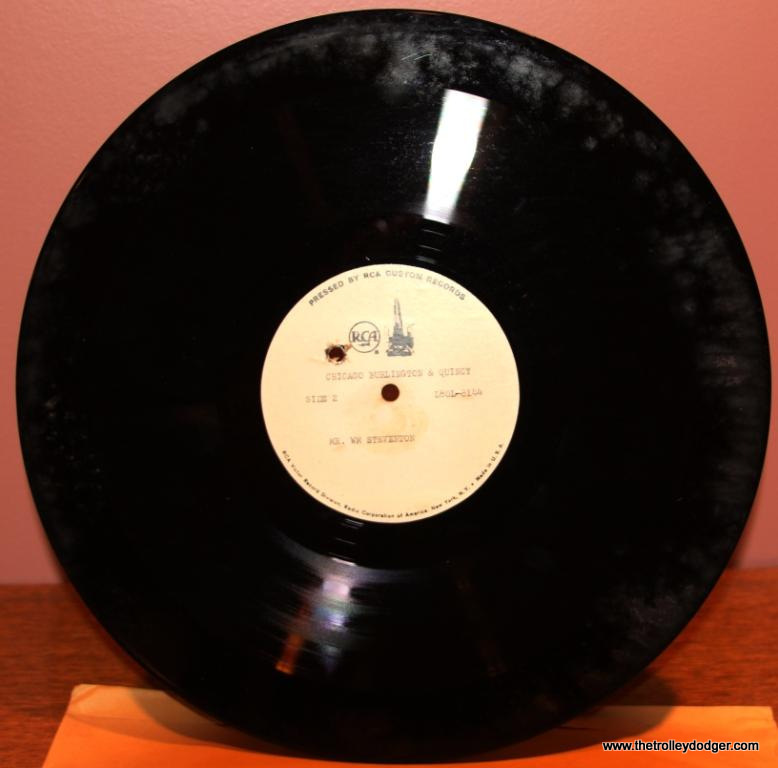 It’s lucky that the only undamaged 12″ RCA test pressings are for the two sides of the same record. 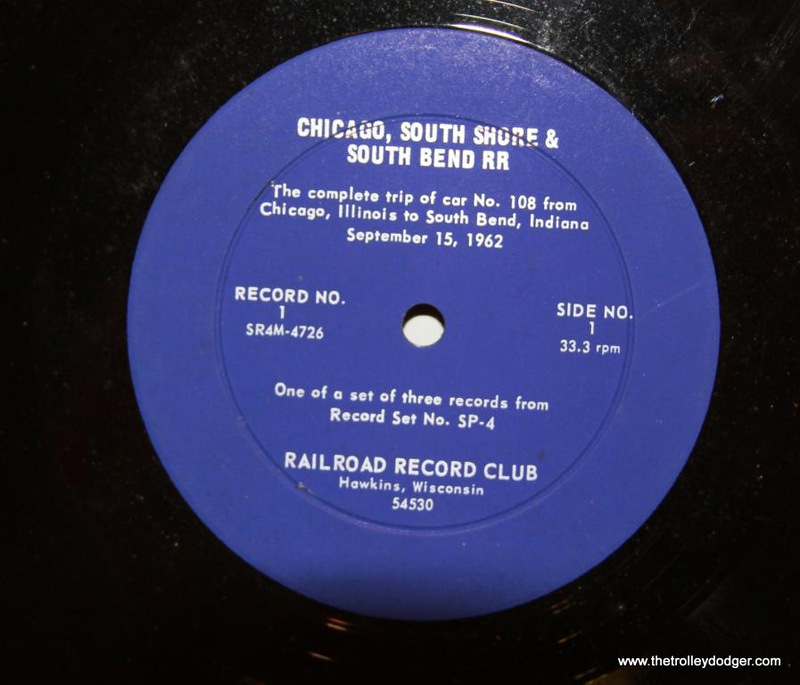 The one good 10″ disc is for side 2 of RRC 25, Illinois Terminal. 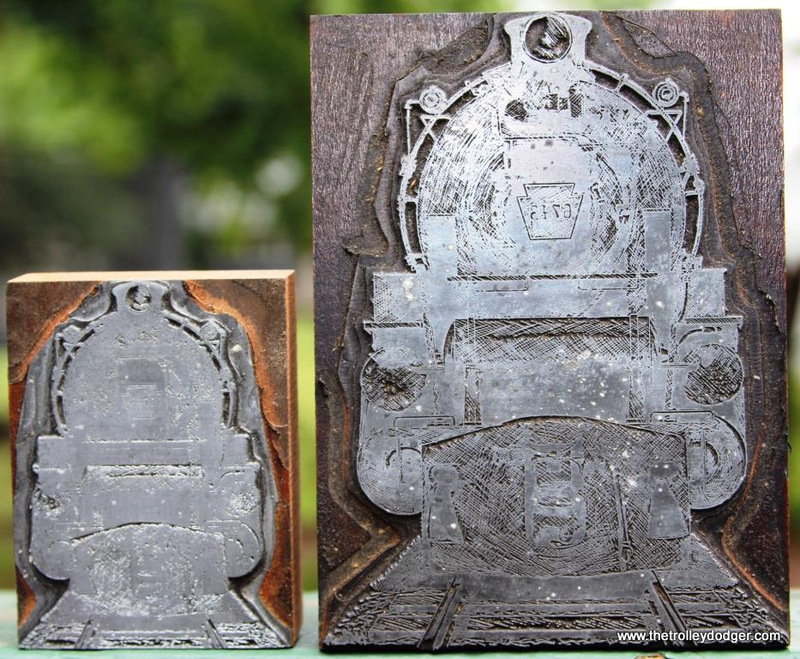 The metal stamping plates vary in condition. I was able to inspect these plates while at the dealer’s property last July, so I knew what to expect. I turned them down last year to save my money for what I considered the good stuff, the artwork and 78rpm records. 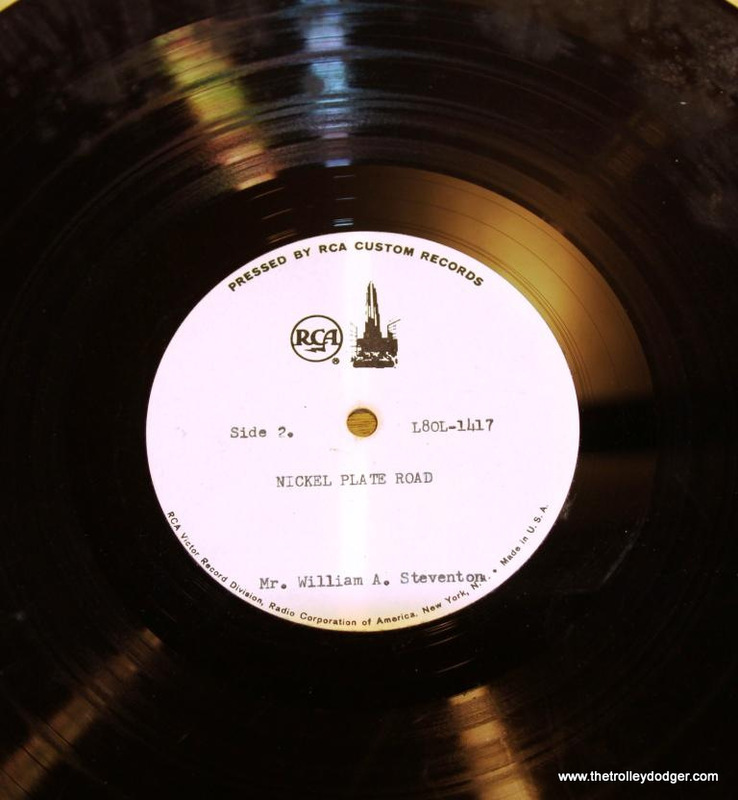 All the original RCA stamp plates were lost in 1973, necessitating the 12″ remaster program. 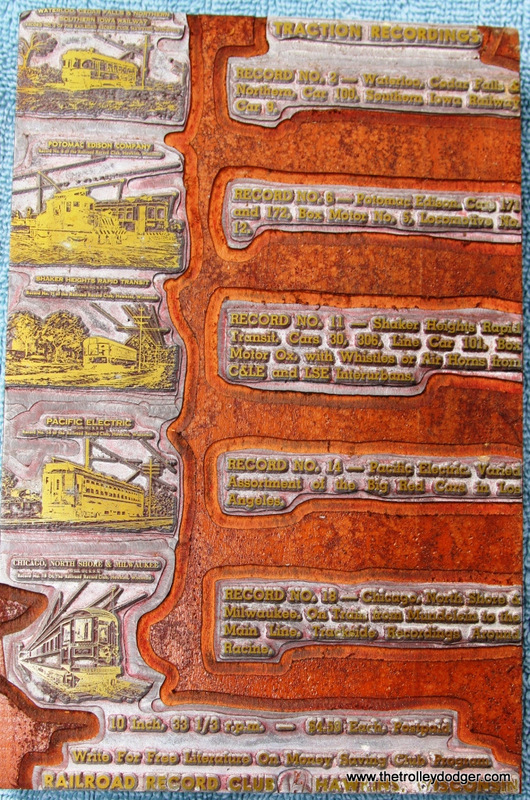 These plates are the Nashville-made stamps made in the late 1970s and throughout the 1980s. As I remember it, all 17 master plates were in the dealer’s warehouse. I only looked at them briefly but the top few were scratched and dented. Now, if I wanted the tapes, I had to buy them. Here I did a little dealing. Since these plates were a bit heavier than the records and I was paying for shipment by the pound, I convinced the dealer to choose a few of the stamps that were in the best condition. Those in poor condition he would not charge me for and he could discard them. The archivist in me wanted to save them all, but compromises must occasionally be made. 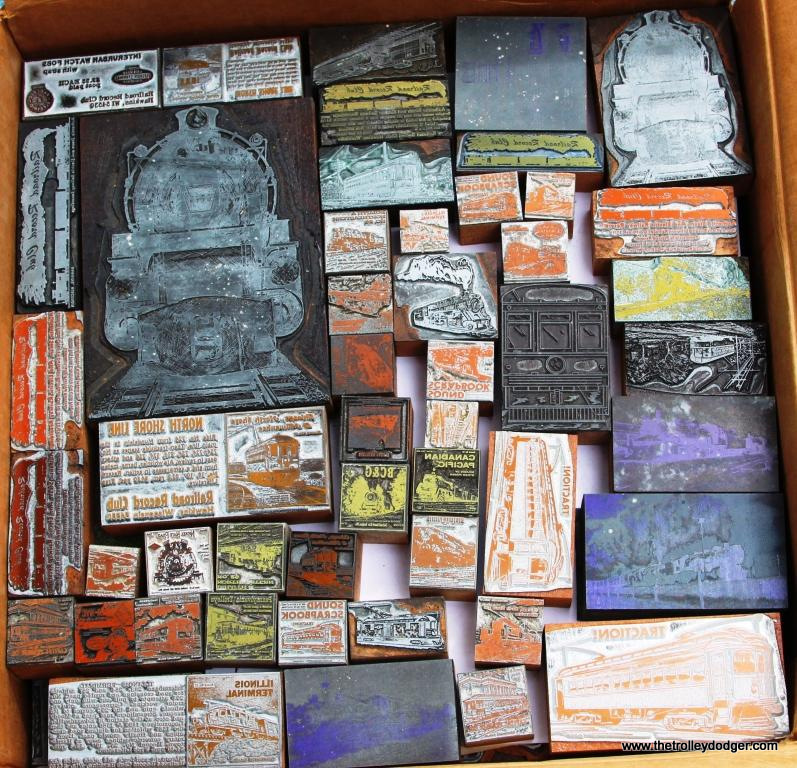 In all I got twelve of these stamps, five are 14″ and 7 are 12″. I ended up with a bunch of returned records as well. Numbering somewhere around fifteen or twenty, these records were returned by buyers dissatisfied with them. 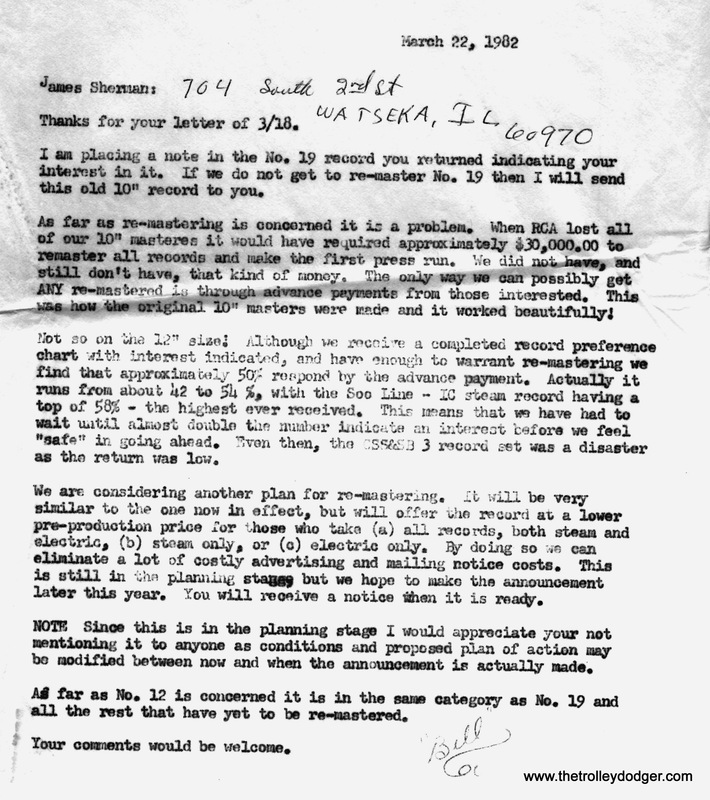 Most of them have a note attached with the buyer’s name and his complaint. Things such as scratches, surface noise, and various clicks and pops were the most often cited reasons for the return. 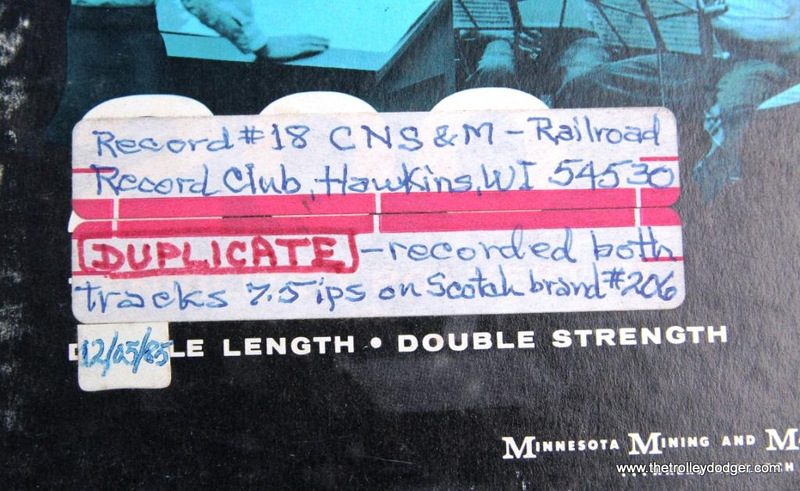 An interesting find was various copies of the records that comprise the three-record set of SP-4. I was able to put together a set of each of the three pressings this set had. A surprise was a set of these records not in the display box that they came in, but in three separate record jackets. 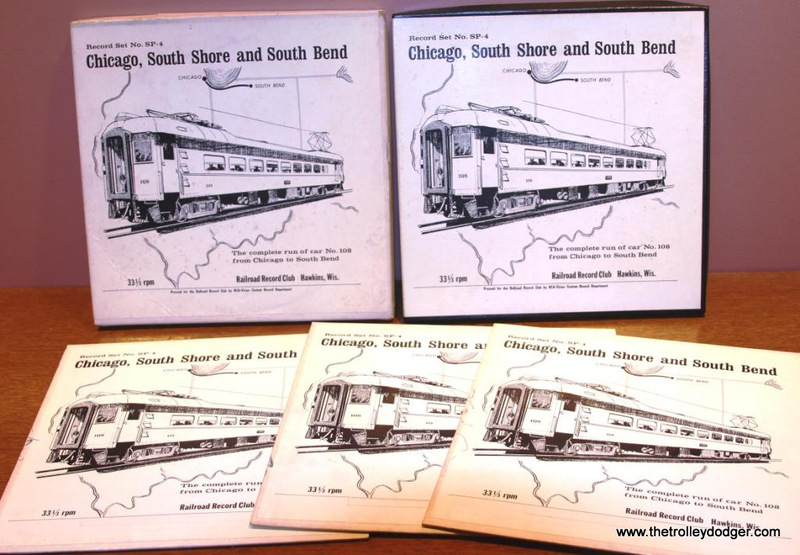 Each jacket had the same drawing of CSS&SB MU #108 that appeared on the box lid. Perhaps this was some sort of test printing or the original idea for the jackets. I may never know but I’m sure it is a unique set. 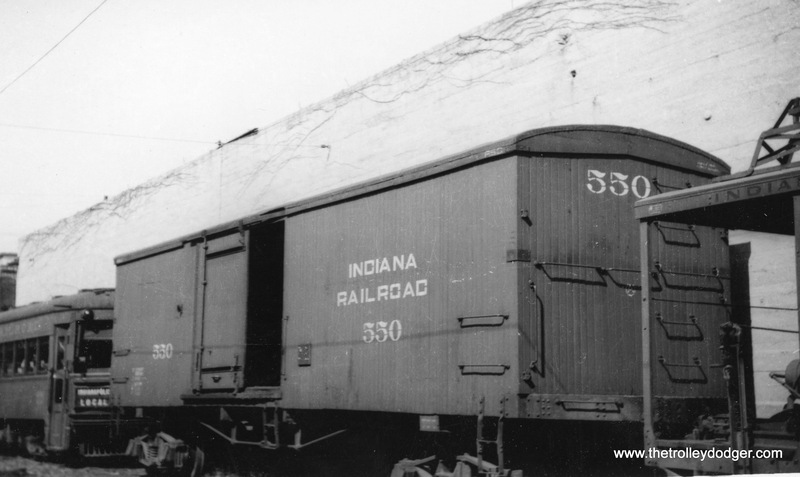 Indiana RR Vigo with rails ripped out. Here again I had to do a little dealing. I went quickly through the box of Steventon photos last year, choosing about 20 photos to purchase. 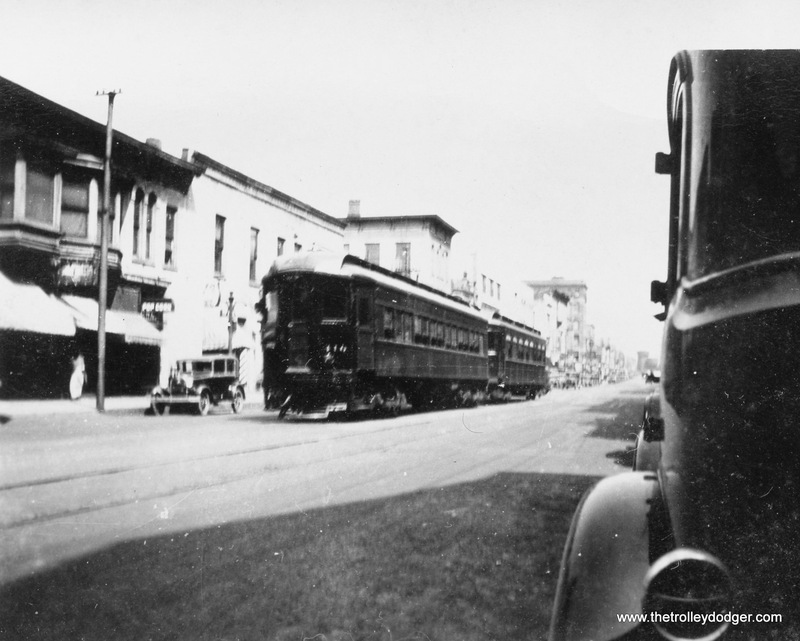 The box contained a mix of railroad photos and family snap shots. The family photos outnumbered the trains. Again, I did not want to pay for, or have the added weight of photos that were just going to be tossed away. Steventon’s son was the one who sold all this family history in the first place, so I saw no reason to try and get it back to him. 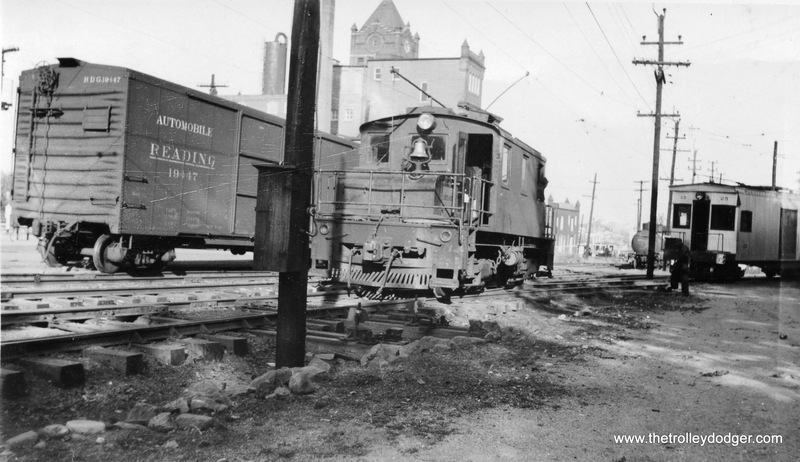 The dealer agreed to sort the photos and sell and ship only railroad photos. He would discard the unwanted photos. 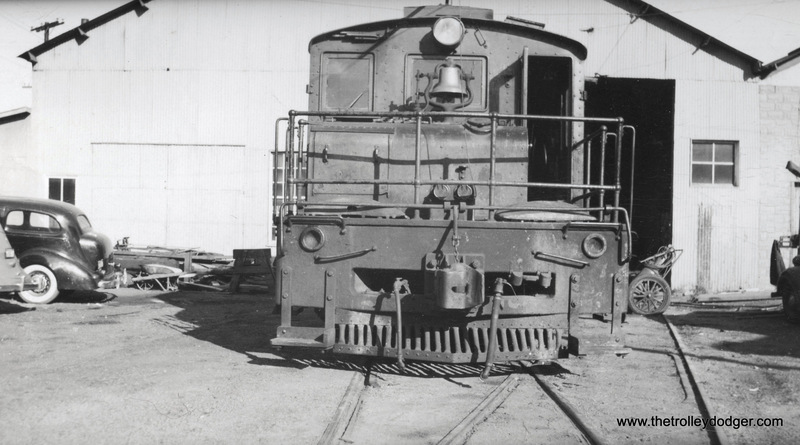 In all there are 135 photos of railroad equipment, mostly traction subjects. Some have complete caption information, and some have nothing. There are 23 photos of active traction right-of-ways but no caption information. 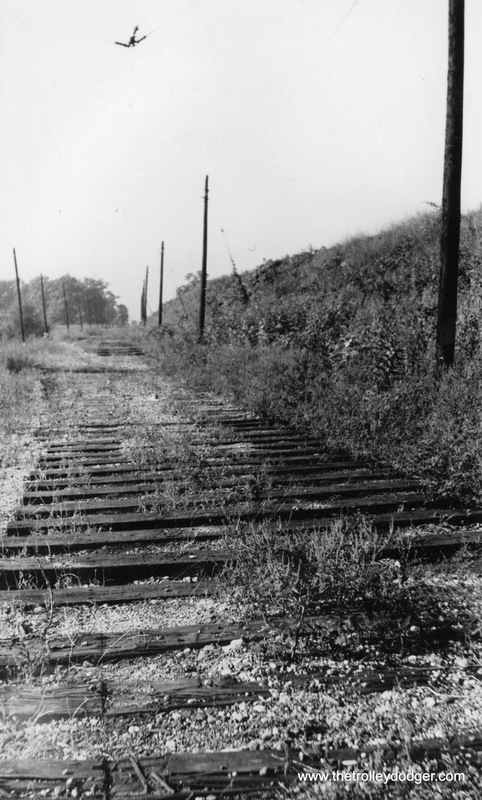 24 photos of abandoned traction right-of-ways have no captions. I cannot be sure if it is a “before” and “after” series of 27 photos. 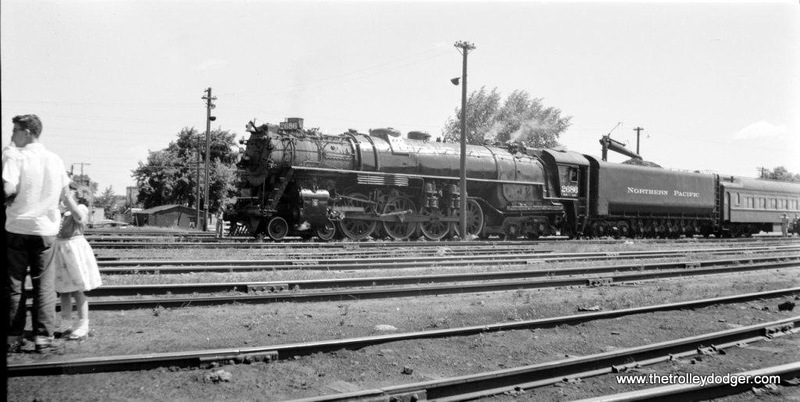 I also received 11 steam negatives, the aforementioned NP 4-8-4 # 2686 (two almost identical shots at Staples, MN) and several D&RGW narrow gauge roster photos. There is one EBT negative and a shot of a steam tractor. I haven’t had time to scan all of these photos yet, but they will appear in the Trolley Dodger as I do. For now, here are a few scans to whet your appetite. There was one last surprise waiting for me. 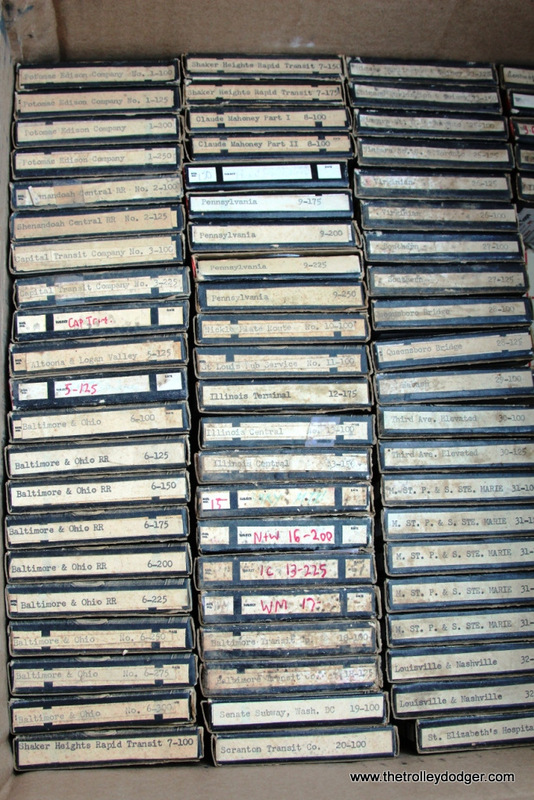 There are eight VHS video tapes in the estate lot, seven of which were professionally produced programs of traction subjects, several of which Steventon provided audio for. 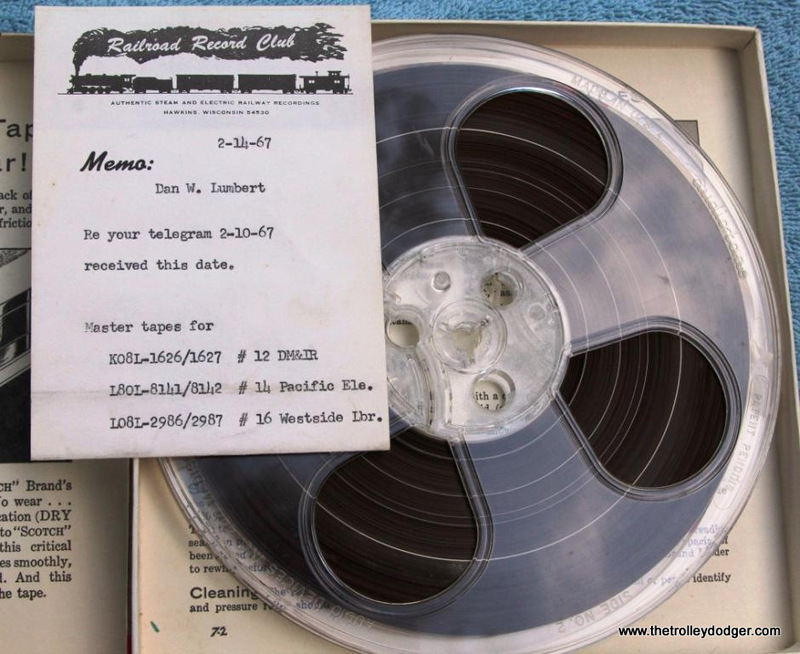 One tape on a store-bought blank was labeled simply “Railroad Programs”. I thought it was most likely a tape of TV shows about trains, but I popped it in the player just to see. 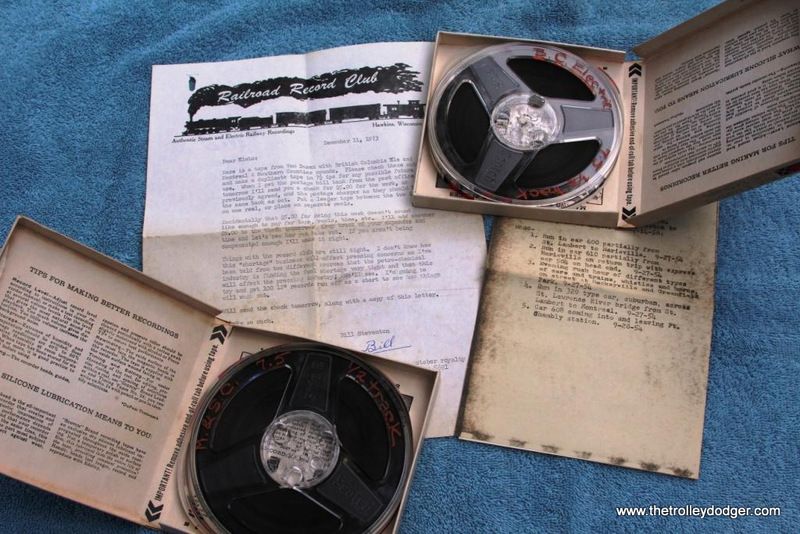 It turned out to be a recording of a presentation that Steventon made to a local historical society. The video quality is bad, but you can hear everything he says perfectly. It’s all really basic stuff, what you would expect him to present to a general audience. Such things as the appeal of a steam locomotive, the nicknames of various railroad job positions like “Hogger” for engineer etc. He then gets into the “sound portion” of his talk. 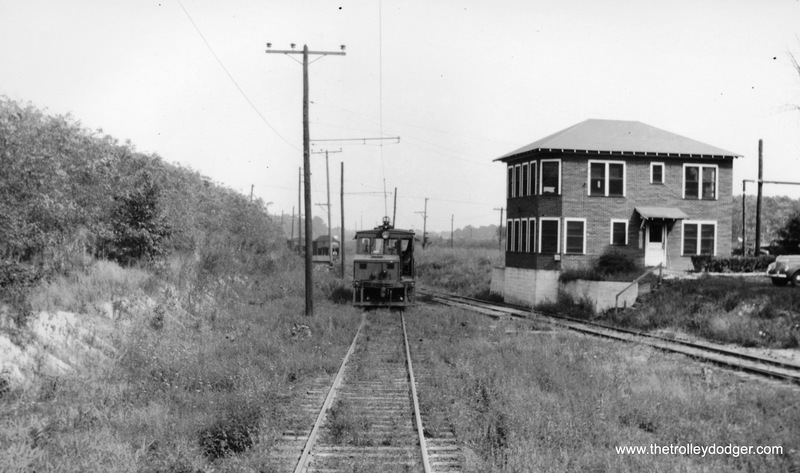 He has a reel to reel tape player with him, and he explains the use of whistle signals and then plays a cut of a B&O EM-1 from Record number 4, noting the “two longs-a short-and another long” signal for a road crossing. He then goes into how a steam locomotive gains traction. Here he plays the sequence of SOO Line 2718 backing off the wye track from the intro record. 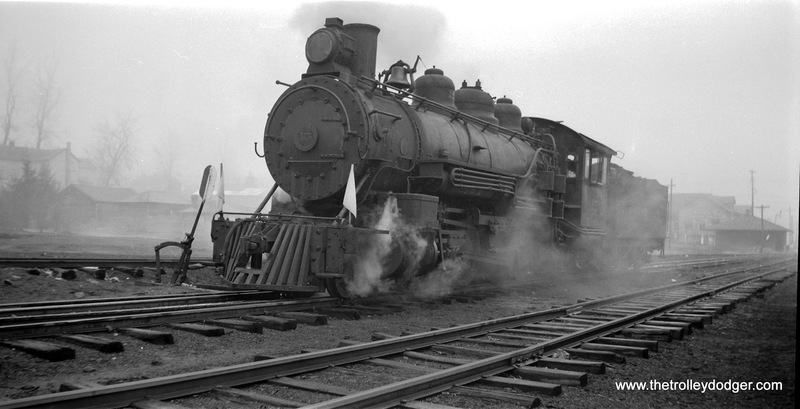 He stops the tape at places to note the change in the locomotive’s sound and what that indicates to the engineer. Next, he talks about the use of torpedoes as a signaling device and plays a cut from Record number 8. He never says that these sounds are from his records. 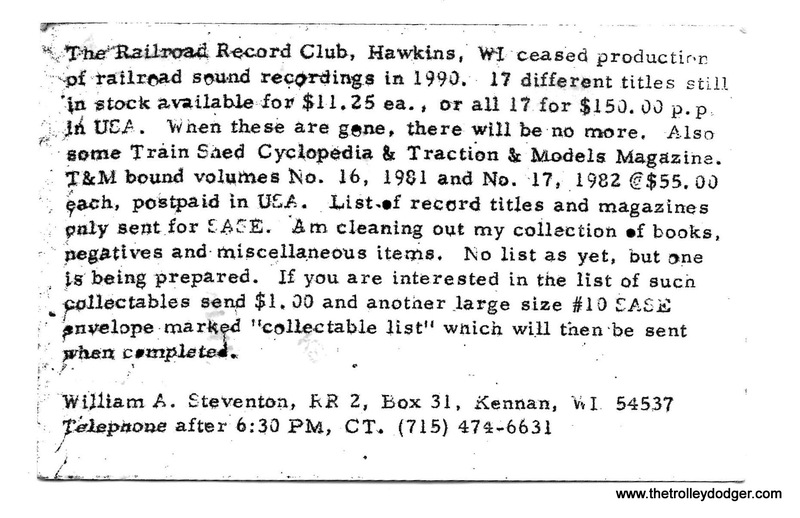 In fact, he never mentions that he ever sold records and the Railroad Record Club is not once referenced. He eventually brings out a chart of steam locomotive wheel arrangements. He walks out of frame with it, but you can still hear what he is saying. At some point someone thinks to pan the camera around, but the view is only the back of the chart! By the time he finishes with the chart, the program has gone on for about 40 minutes. Now he introduces “Whistle ‘Round the Bend” and plays the entire record, all 30 minutes. While the camera never moves during this, and Steventon just sits there listening, it’s a bit of a poignant moment. The video quality, as I said, is poor, and he is in the center of a wide shot, but it’s still possible to see that he is moved by the words and sounds he his hearing. While little information is given about how, where, or when the sounds he played were recorded a little more personal stuff is revealed. He tells of the day in 1936 that his mother died. His father was at work and needed to get home. The NYC put every opposing train on the siding and he had green signals the whole way. He also tells us that he was a sickly child and his father took him onboard the locomotive with him, even against the rules, because he wanted to spend time with him, and make William happy, as the doctors said he may not survive into adulthood. With this video I was able to “know” William Steventon just a little bit better. As I have these tapes put on to CD, they will be offered for sale in the online store. I bought these tapes not to just save them from destruction, but to have them made available to everyone who may be interested. I think that is perhaps the best way to ensure these historic sounds are preserved. 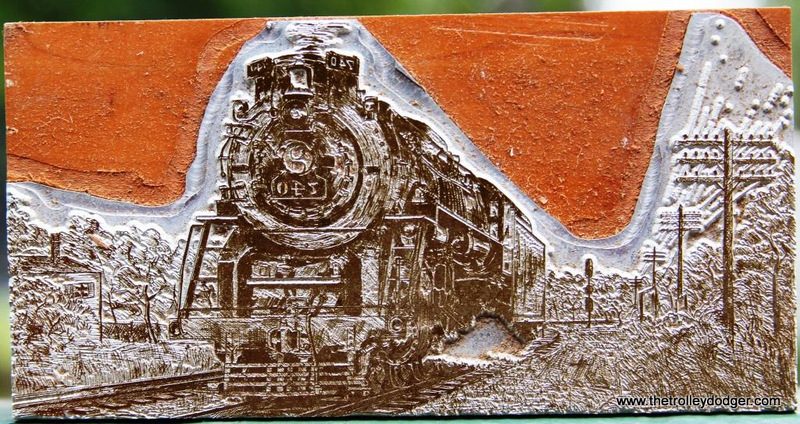 Not just as a tribute to the people who recorded them who are now gone, but to ensure these sounds will endure to instruct and entertain future railfans long after we are gone too. 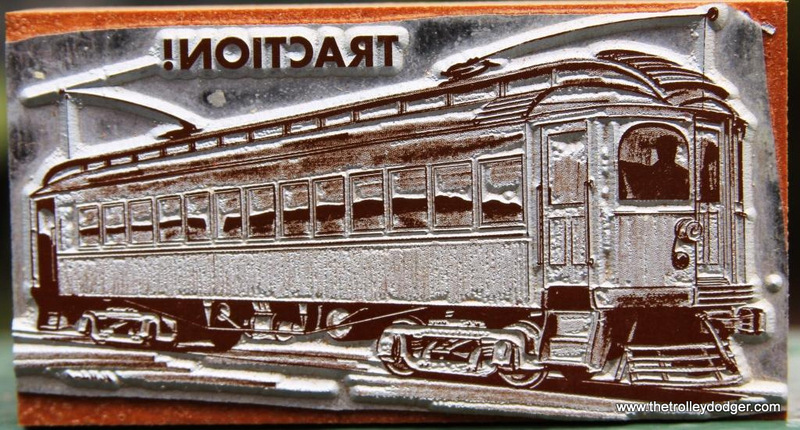 On February 6, 1955 the Santa Fe Railway ran a railfan train from Los Angeles to Barstow and back for the Railway Club of Southern California. 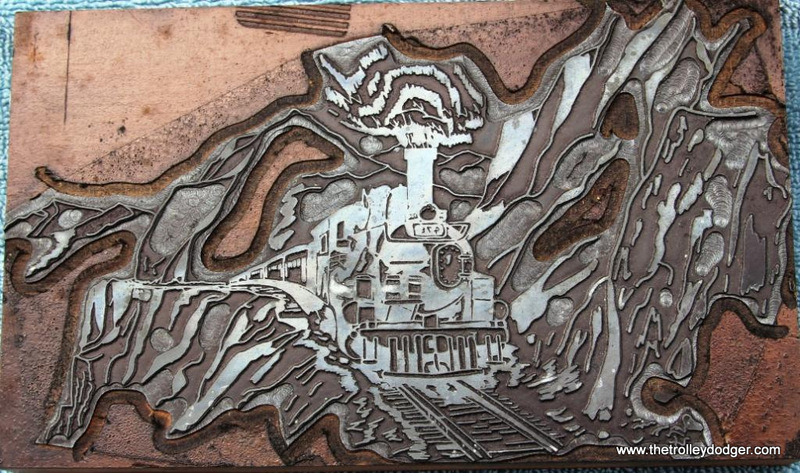 This was Santa Fe’s last run powered by a steam locomotive over this route. 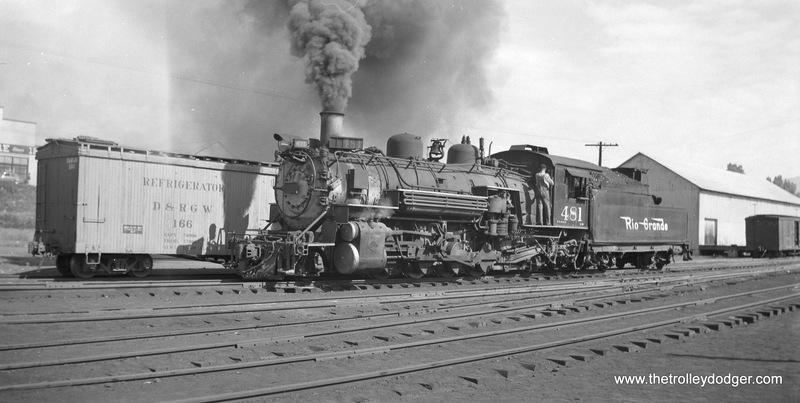 The engine was a 4-8-4, #3759. We have used the original, rare 1955 mono version of this recording, and not the later 1958 reissue that had a bunch of echo added to create a fake stereo effect. 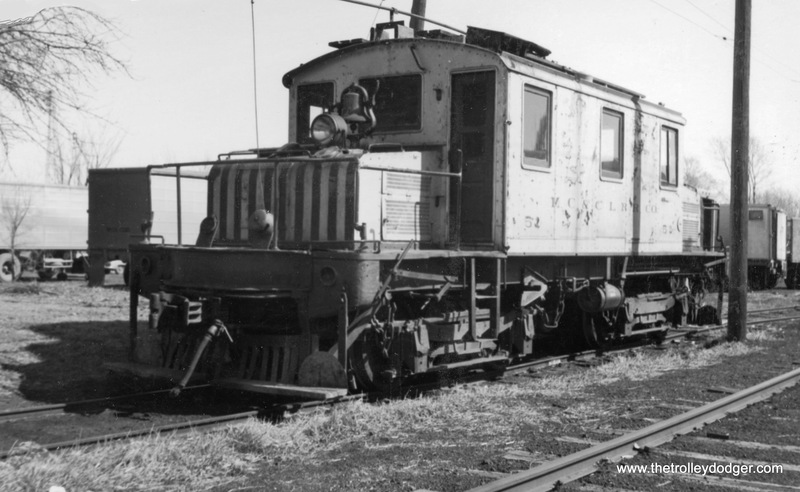 When diesel locomotives replaced steam in the 1950s, they offered a multitude of different sounds. 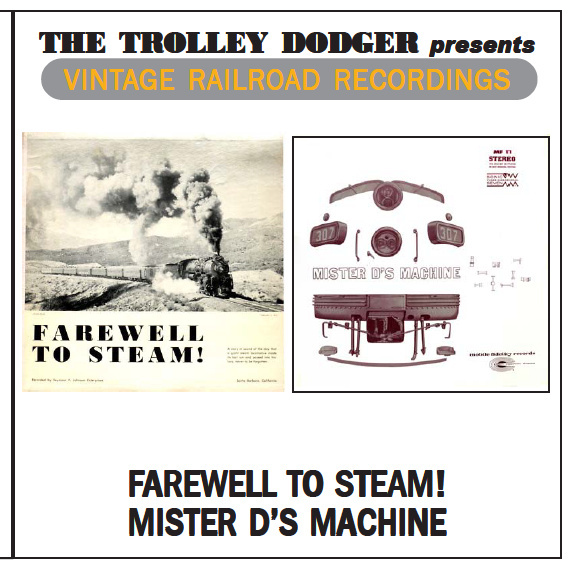 This original 1963 stereo recording showcases the many sounds of diesels on the San Joaquin and Los Angeles Divisions of the Southern Pacific, including the Tahachappi Loop, an engineering feat that made modern railroading famous. As with all of our recordings, this CD comes with the complete, original liner notes. 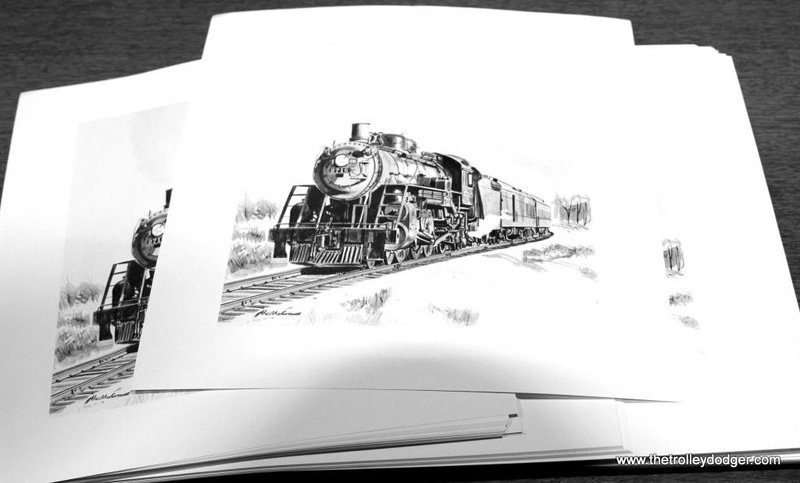 This is our 221st post, and we are gradually creating a body of work and an online resource for the benefit of all railfans, everywhere. To date, we have received over 446,000 page views, for which we are very grateful. 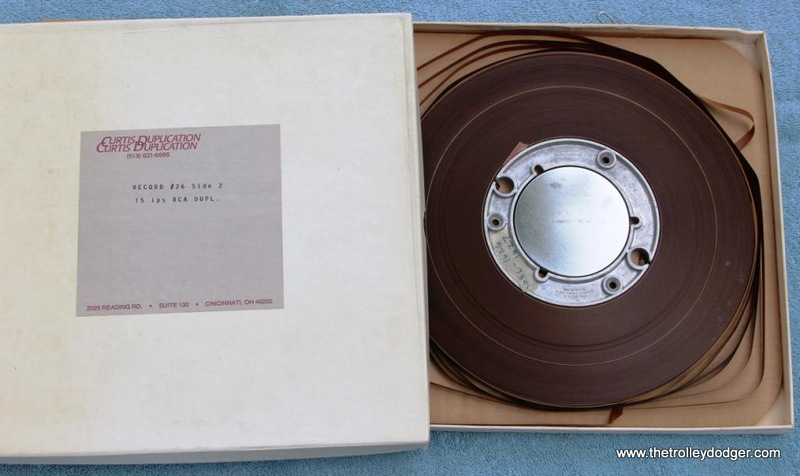 Please contact me regarding preservation and production of all or at least a number of these recordings. 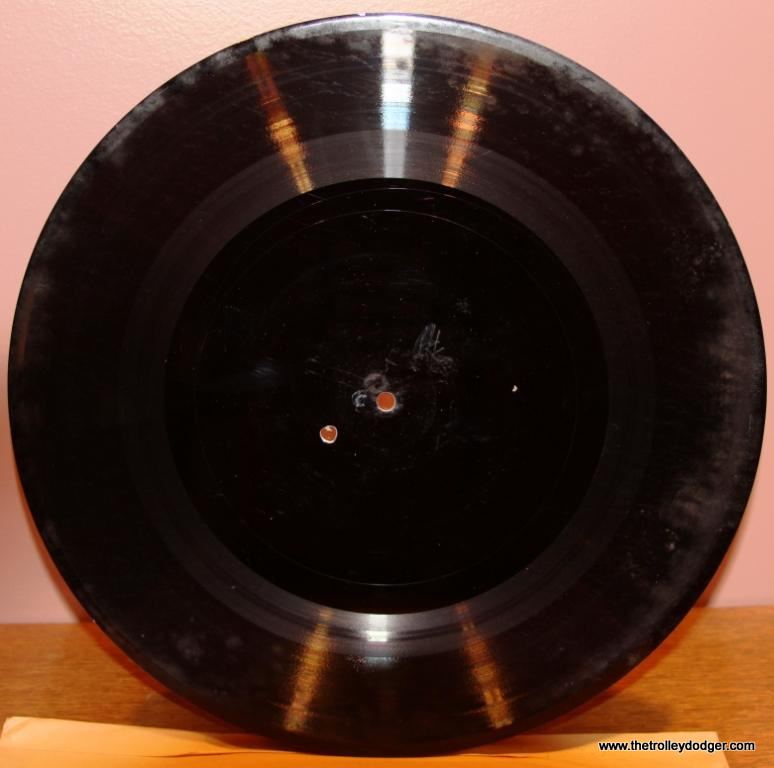 I have contacts in the record pressing short run production industry here in NYC or even digitalization of these recordings, and may be able to connect you to people who could restore what is restorable. 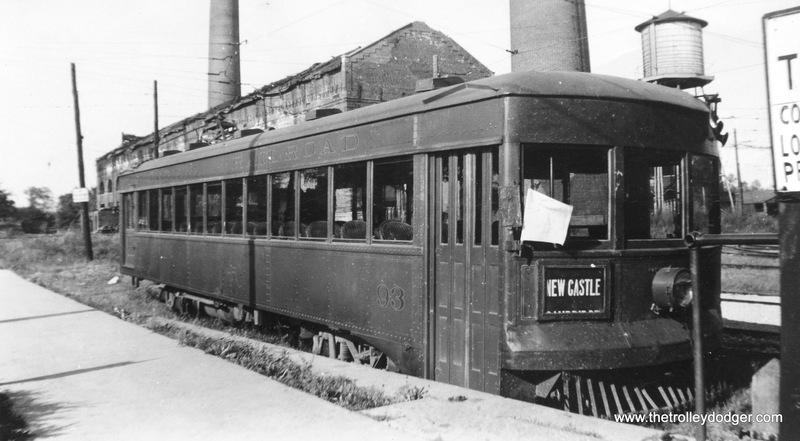 I am personally interested in the NYC transit and trolley recordings, as well as the Shaker Heights and the ex-LSE steel car recordings made in Iowa. Thank you for taking this on! I will forward this on to Ken, thanks. 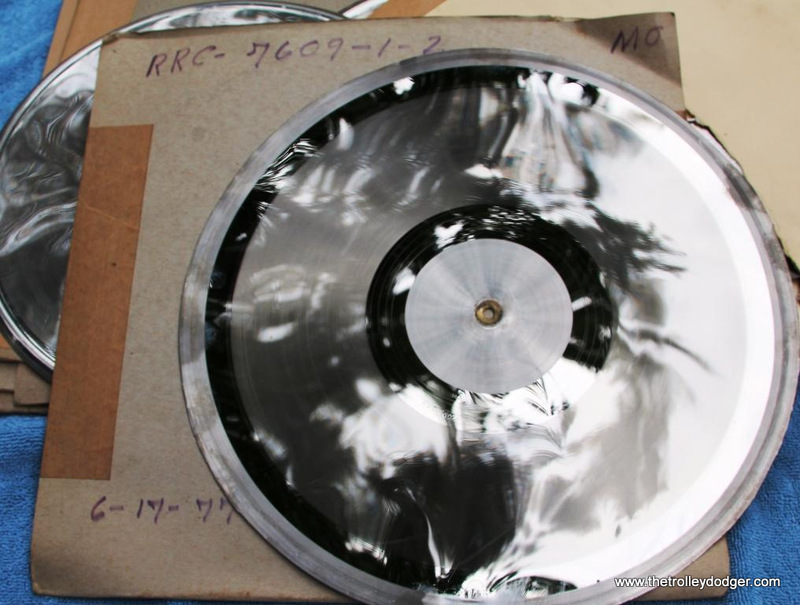 It’s worth mentioning, however, that we have already digitized all the RRC LPs that were issued. Our first priority is to digitize unissued material, and Ken already has a professional contact who can do that. I don’t think it would be economically feasible to re-press more vinyl, as this is a very limited market. 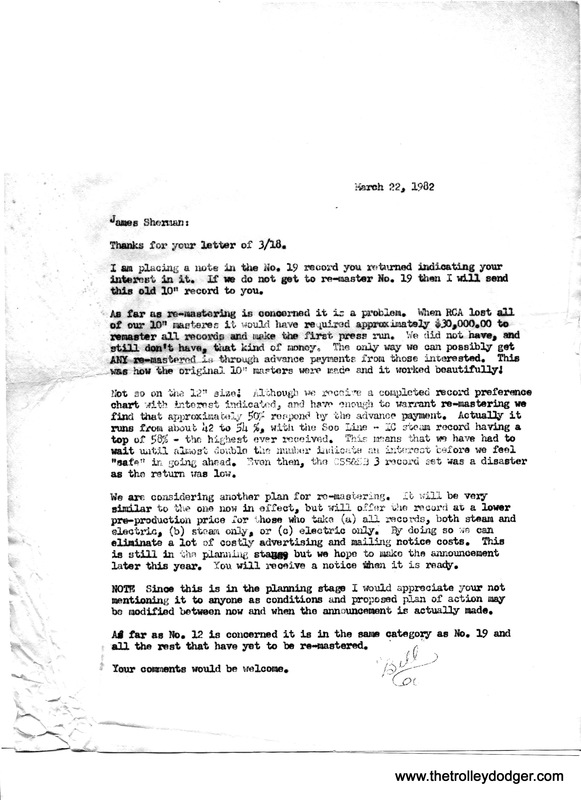 Mr. Lorenzen, Thank you for your interest in these recordings and your offer for assisting in their preservation. As David said, I am working with a professional restoration sound lab, Deep Sky Audio of Vail NC. I have worked with these people before and have been quite impressed with their work. 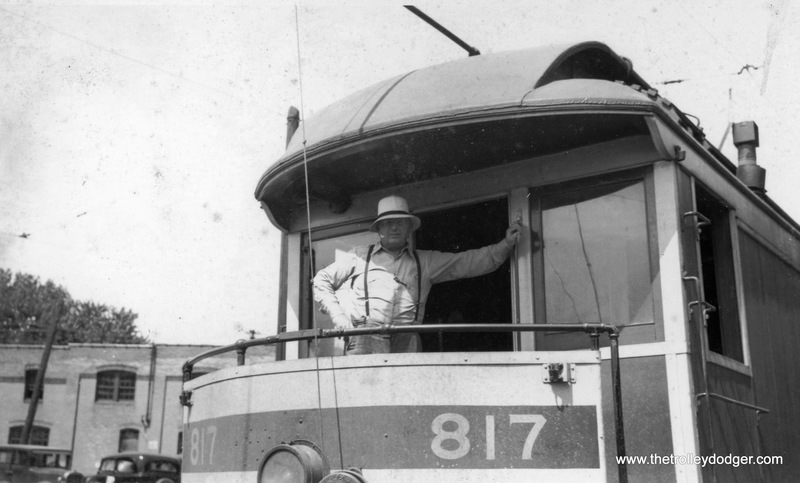 The Trolley Dodger CD Santa Maria Valley Railroad, 1959 was produced using a source CD from this firm. David did a little “tweaking” and the resulting CD sounds very good. 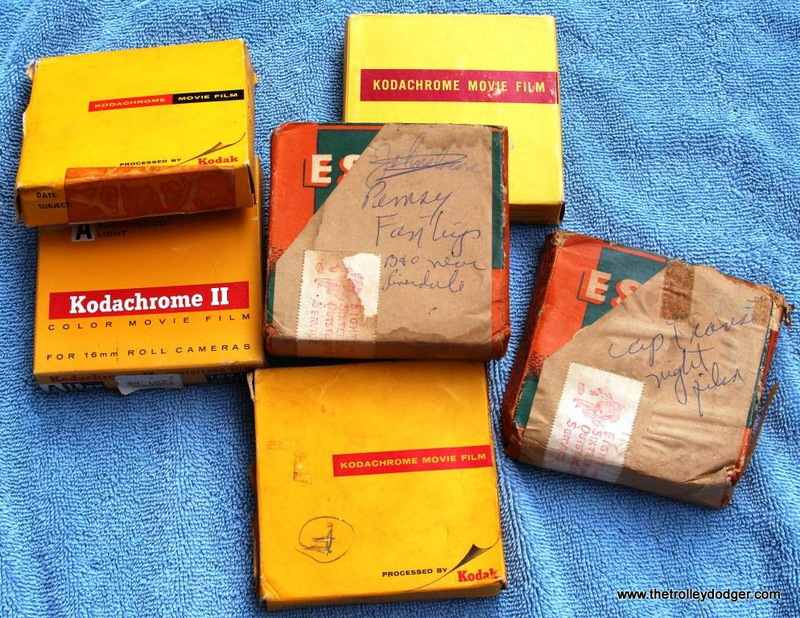 I am, however, not under any obligation to continue using them and would consider another means of digitizing the tapes if I knew I could entrust the tapes to their care and received a quality transfer. I recently sent out 11 of the 2 1/2 inch reels to Deep Sky. I am waiting for their evaluation of the tapes and the cost of the transfer to CD. I want to wait until I hear from them before making any other arrangements. I would be willing to send the same tapes to someone else after I get them back from Deep Sky and have a second digitalization done. David and I could then compare the two CDs and decide which firm to continue with. 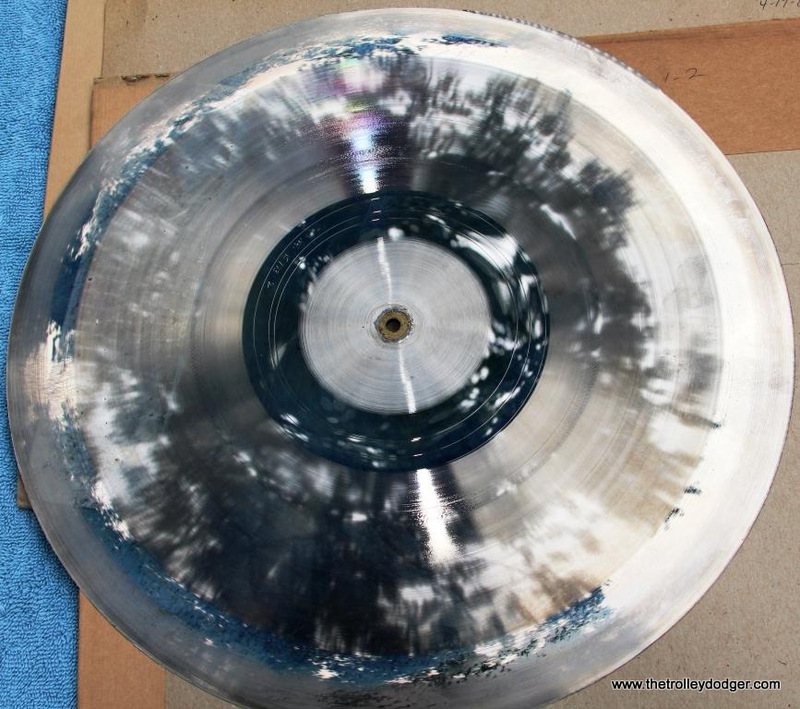 Also, I must admit the pressing of a new Railroad Record Club vinyl record is a very intriguing idea to me. Perhaps a one volume collector’s edition of some of this unissued sound could be accomplished, some time in the future. He seemed to go a lot of places where things were about to quit. 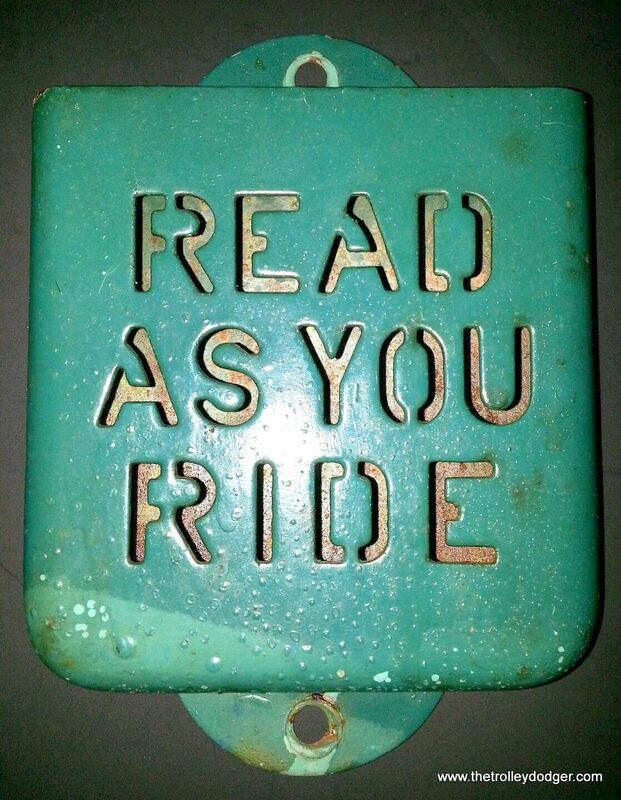 I will pass this along to Kenneth Gear, thanks. Hi Tyler, Yes I do plan to sell those records but I haven’t set -up anything yet for doing so. However, if you email me at gearken@yahoo.com we can certainly work something out.